WOW!!!! Whaaaaaat???!! Awesome!!! 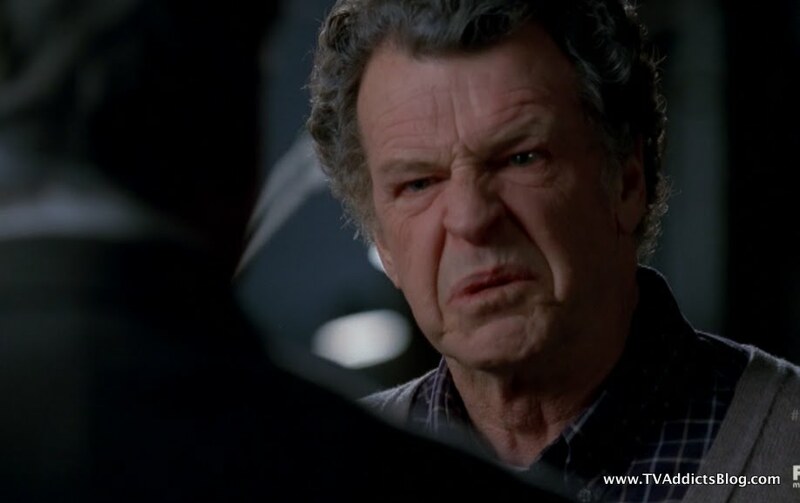 Those were pretty much my reactions at the end of the Fringe season 3 finale last night. What a fantastic, perfect and crazy way to end such a fantastic, perfect and crazy season. A lot of the ideas we had been throwing around on this blog did, in fact, happen. But, the way they went about it is what's so shocking and awesome! And it has left us with questions to ponder all summer. Everyone reading this recap right now, force someone you know to watch seasons 1-3 of Fringe this summer. If they have any sense about them, they'll realize that they have been missing out on some awesome stuff! I had been thinking it all season but now I can say with full confidence, THIS SHOW is the true heir to LOST! The finale just proved it. WOW!! Fringe, you've truly earned my use of the sacred WOW! Let's get into this recap folks. I'm not even sure how I'm going to go about that just yet. But I'm sure I'll figure it out! We we last left Peter, his mind had transported to the future where he saw the Freedom Tower and a whole lot of destruction. Apparently, he had been shot too. We continue the story witnessing a very very bleak future. 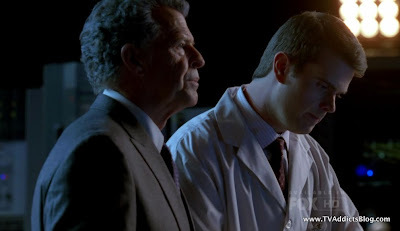 Peter ends up at Fringe Medical to be cured by some advanced technology. It isn't long before we notice that Astrid is in a different role than she was in the present day. She is now a Fringe Agent and no longer babysitting Walter. We also meet a grown up Ella Dunham, Olivia's niece. No word on if Olivia's sister has survived to 2026 but it's probably not important. Ella has followed her aunt into the Fringe realm and has become an agent herself. We find out that Peter is in recovery and doing just fine. Olivia walks in with her professional business attire and it isn't long before we find out that she is in charge of the now very large and public Fringe Division. We learn that there is a terrorist group reigning terror on the future known as the End of Dayers. They are intent with bringing the universe to an end by using Light Bombs to trigger soft spots to open vortexes and bring the "end of days" even more quickly. This group is led by a man named Moreau (Brad Dourif whom many like me will recognize from Lord of the Rings and Deadwood. But apparently, his claim to fame is from Dune.) 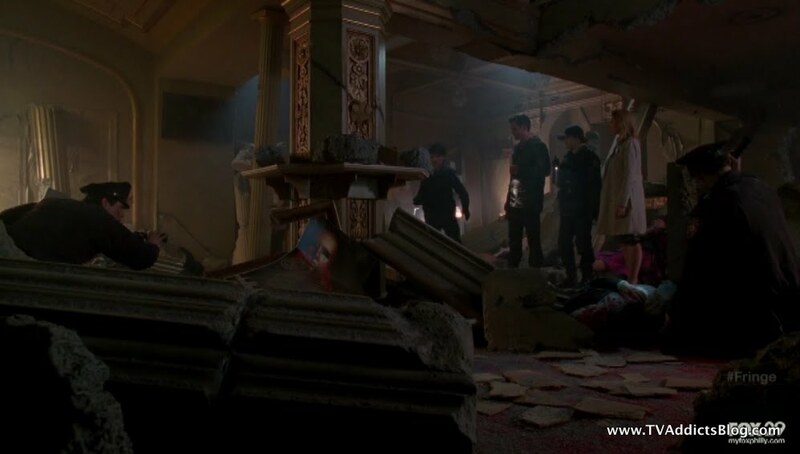 We witness one of their attacks on the infamous Opera House where Olivia, Walter and a bunch of cortexiphan kids headed over there to save Peter at the end of last season. 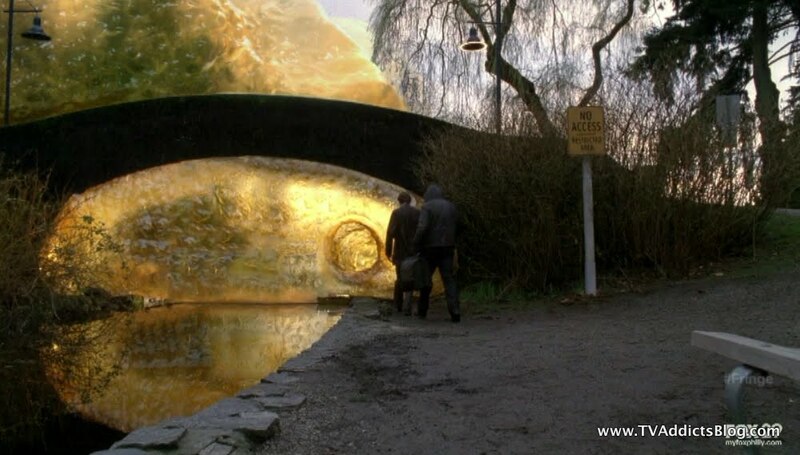 This location was sealed in amber on the other side but over here we just knew of it as a soft spot between universes. Peter and Olivia have taken the next step in their lives and have gotten married. But, Olivia dreads bringing a child into the world when there is no expectation that the world is going to continue to exist. They feel like it is an inevitability that the universe will tear itself apart. Why? We'll get there in a second. Peter, apparently was only his 2011 self for that initial moment in the field. It was similar to the first time he touched the machine and become temporarily disoriented. Of course, we learn by the end of the episode that his 2011 consciousness being present in 2026 was entirely intended by the First People. But we'll get there! Peter proved to Olivia and Ella that he is of his 2026 self by telling Olivia what he cooked her for breakfast last weekend. We learn that Amber protocols are being used regularly in our universe now. Peter, Olivia, Ella and Astrid head to the opera house to investigate the crime scene. They discover one of the electro-lights bombs. It must have been a dud, but Peter states that this is a big find for the Fringe division. They return to Fringe HQ in Boston where Peter tries to dissect the bomb and learn how it works. The only conclusion he can come to is that it shouldn't work at all. 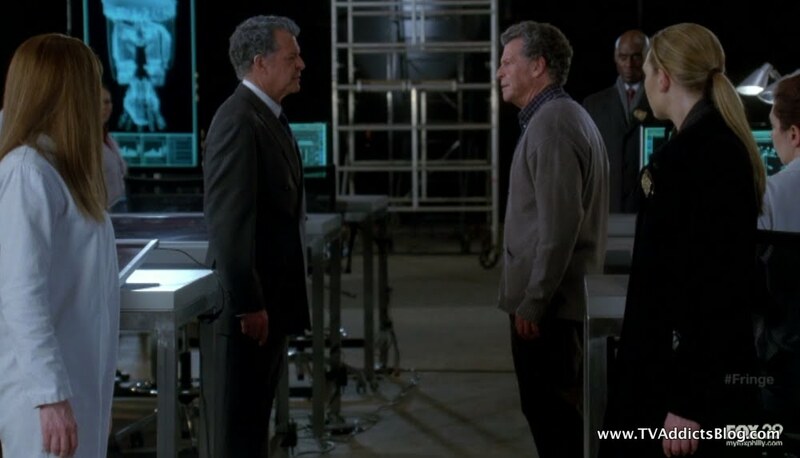 Peter requests that they be able to contact Walter so he can figure out how the bomb functions. Apparently Walter is not in as good of shape as he was 15 years ago. They need to call in favors to even talk to the man. 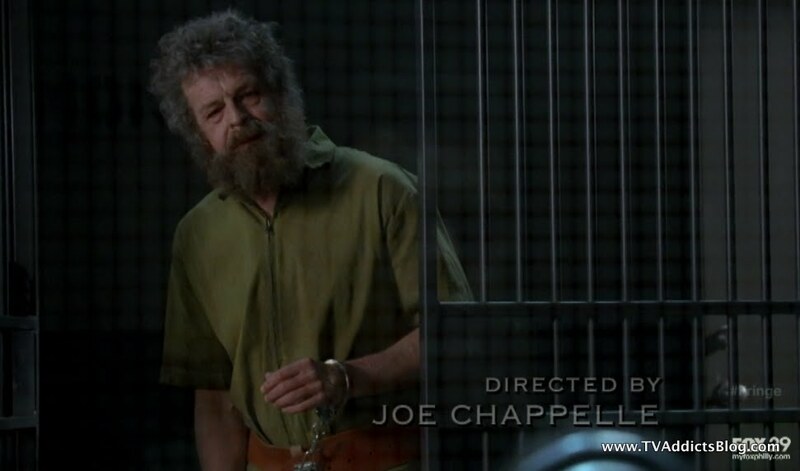 Peter goes to visit Walter in prison where he has grown himself a nice shaggy beard reminiscent of the one he sported in the pilot episode. Walter knew things must be bad if they were letting Peter talk to him. 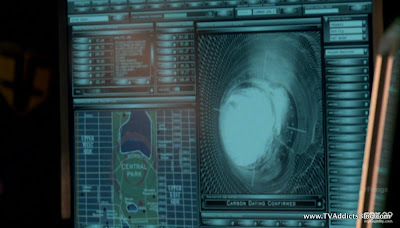 Peter explains that a wormhole emitting massive amounts of radiation opened up in central park that took them months to conceal in amber. Walter is confused because wormholes that emit that amount of radiation can only be wormholes through time. Peter explains that this is exactly right, apparently they were able to identify that the carbon levels were consistent with the late Paleozoic era (250 million years ago). 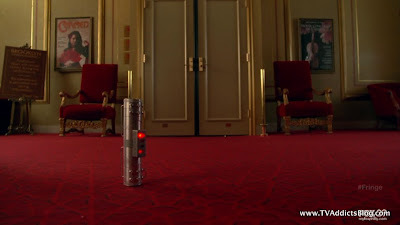 This was our first clue in this episode to where things were going. After exchanging some pleasantries Peter gets right to business. He needs Walter's help with the bomb. Walter shows excitement at the prospect of a new investigation, but he cannot do much in his current surroundings. 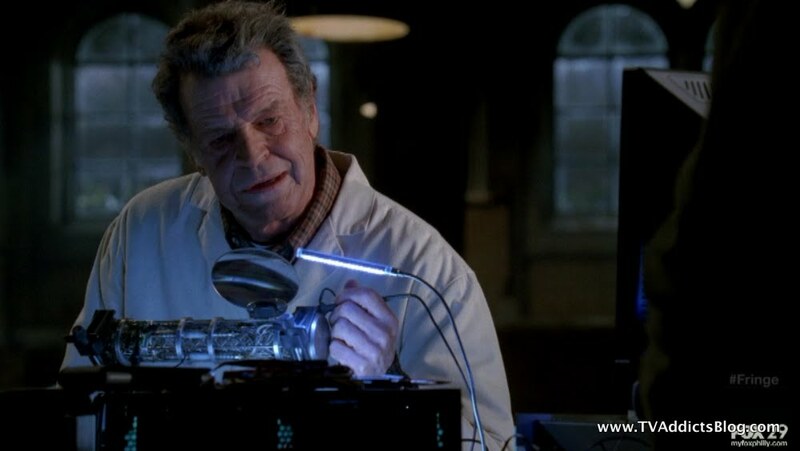 He needs his tools and while he didn't say it, we knew he wanted to be back in his lab too! But, something so devastating happened that Walter and Peter knew this would be a difficult thing to make happen. 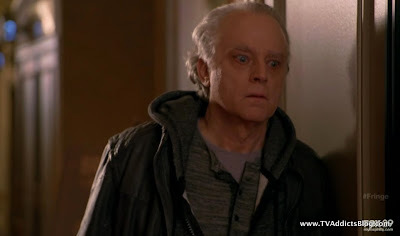 Enter Senator Broyles! Peter goes to D.C. to visit Broyles who is doing pretty well for himself, except for that crazy blue eye! Peter makes a plea to Broyles to let Walter out of his prison to help with the bomb. While Peter accuses Broyles of not allowing it because he's concerned about re-election it really is because of the gradual destruction of the universe. Apparently, the whole world seems to blame Walter for causing all of this. Ironically, Walter was initially most reluctant at even assembling the machine and now he is getting the entire blame for what happened. 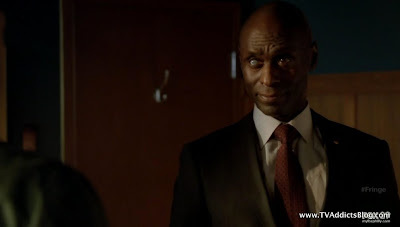 Broyles knows it wasn't Walter's intention but he is speaking for the people who have all lost someone BECAUSE of him. Peter says that they need his help or there will be MORE casualties. He then lowers his voice and talks about something they both lost in Detroit. "If what we lost in Detroit still means anything to you, just give me one chance." Woaaa...what happened in Detroit?! They seemed to be placing these seeds in the episode. Key decision points in the past that led to where they're at now. So there's a chance that this Detroit event may still happen even in the revised timeline (whoops, skipping ahead). Perhaps this Detroit event is where Broyles ended up with the crazy eye? Per the producers, we are meant to be asking about this one. The Detroit comment seemed powerful enough to grant Peter his request. And we return to THE LAB at Harvard where a clean shaven but clearly older and physically impaired Walter returns. 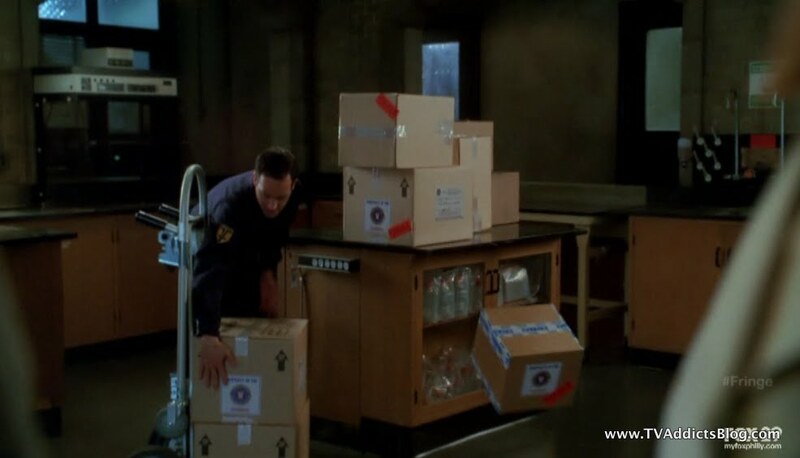 All of Walter's equipment are still in EVIDENCE. There apparently was a huge trial that Walter was the focal point of. Peter spoke kind words in his favor but wasn't able to clear him. Olivia comes to visit at the lab and there is a sweet reunion for the 3 of them. Walter congratulates (many years too late) Olivia on getting married and welcomed her to the family. It is interrupted by the people bringing his equipment in being less than careful with the boxes. We then see a box floating before hitting the ground. Yep, Olivia mastered her telekinesis! But she only did it a few years before, so it still took her lots of time to perfect it. Meanwhile, we catch a glimpse of Moreau and his benefactor who turns out to be none other than Walternate who is intent on revenge for Peter destroying his universe! 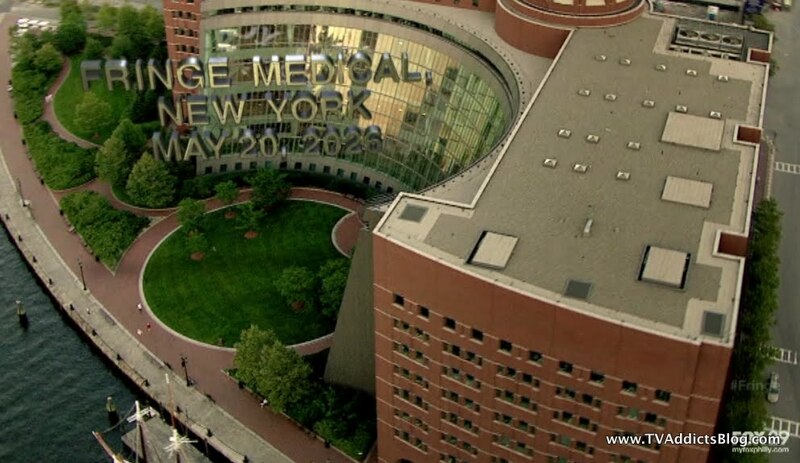 That's right, this is the first time we find out what happened with Peter going into the machine in 2011. The Red World was destroyed. The next End of Dayers target will be the wormhole in central park. We find out that the Red World was destroyed by a wormhole. We also learned that Walternate designed these light bombs and he designed one 2 times as powerful for the Central Park target. 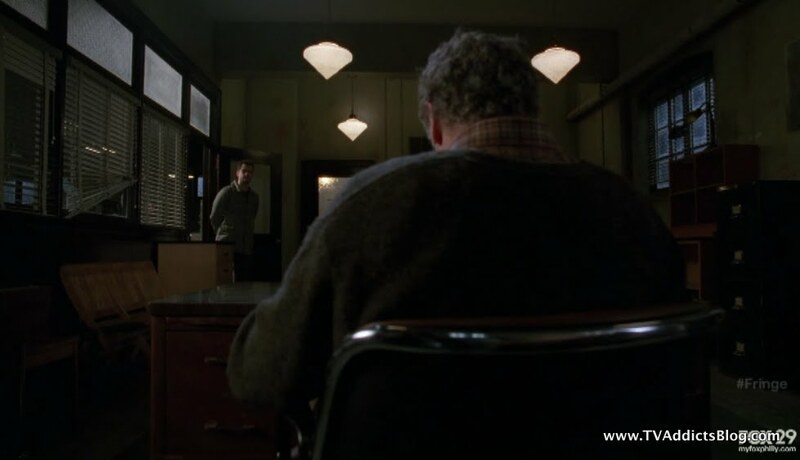 Back at Harvard, Peter returns to check on Walter's progress. Walter is indeed making progress but finds the whole prospect of discovery pointless. We learn, and had theorized, that both universes had a symbiotic relationship. One really can't exist without the other. This made sense to me since Olivia had made the promise to Alterna-Broyles that she would find a way to save both universes. So, ever since Peter stepped into that machine and caused the end of the other universe, it set off a ticking time bomb for our own world (The Day We Died). I wonder, perhaps this timeline's intent WAS to destroy the other world and not just to turn off the machine. In the timeline we've been watching, their intent was not to destroy anything. They just wanted to turn OFF the machine. But I'm getting ahead of myself again. They are all aware of Walternate's presence in this world. He came over here in an effort to save his own world, but ended up stuck here when his world was destroyed. Yeah, that could certainly put a little chip on one's shoulder! 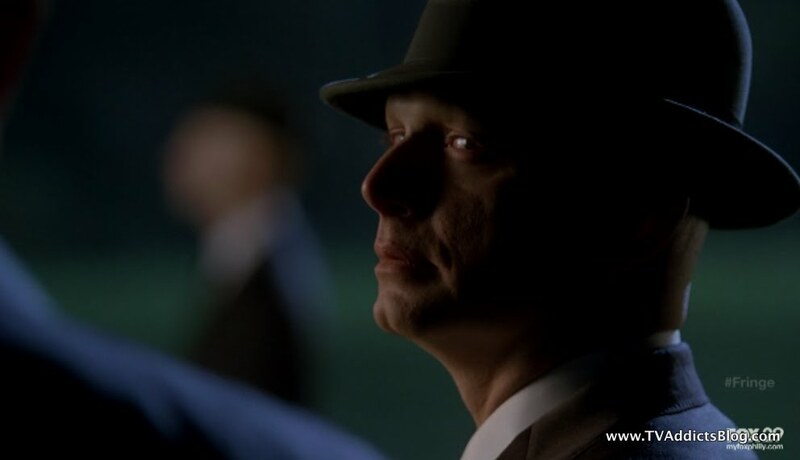 "Not to mention having the same face as the most reviled man in the universe." Walter put the icing on the cake with that line. Peter takes the blame for destroying the other universe. Apparently, the courts perceived that he was defending their universe. But, it was really Walter who was the mastermind of it all. He started it all with his initial crossing of worlds. 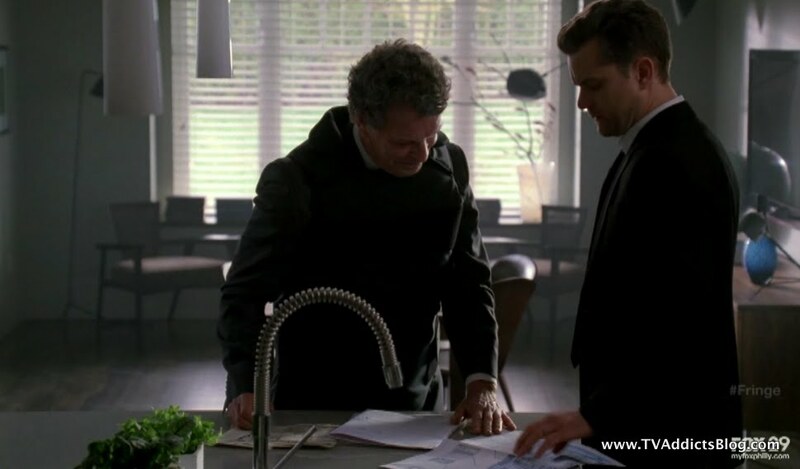 But there is a sweet moment where Peter said no matter who is at fault, Walter is his dad. Awwwwwwwwwww! They followed the trail to a campsite where supposedly Walternate split atoms and constructed the bomb. Peter discovers something at the site. Recognizing what it is, he keeps it to himself. He lies to Olivia about where he is going and heads straight to Reiden Lake to the house he grew up in. 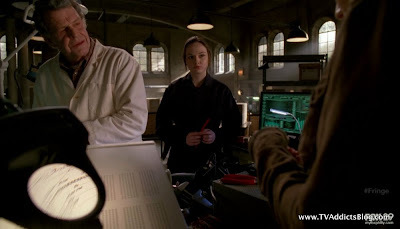 Walter, Ella and Olivia are at the lab where Walter says the bomb is 10-15 years ahead of its time and something he wishes he would have invented himself (for peaceful purposes of course). And of course, we know that Walternate designed the bomb at a lot of the other universe's technology was 10-15 years ahead of our world. Meanwhile, Moreau and his goons are planting the bomb at Central Park's amber site. Astrid sees that there is a spike of activity at Central Park. Olivia gets the call and she and Ella head to the site. Peter arrives at Reiden Lake, has no service so does not get the call about the Central Park incident. He uses the key found at the campsite to enter the house. And there sits Walternate. He says he couldn't just call Peter as he wanted a proper reunion. 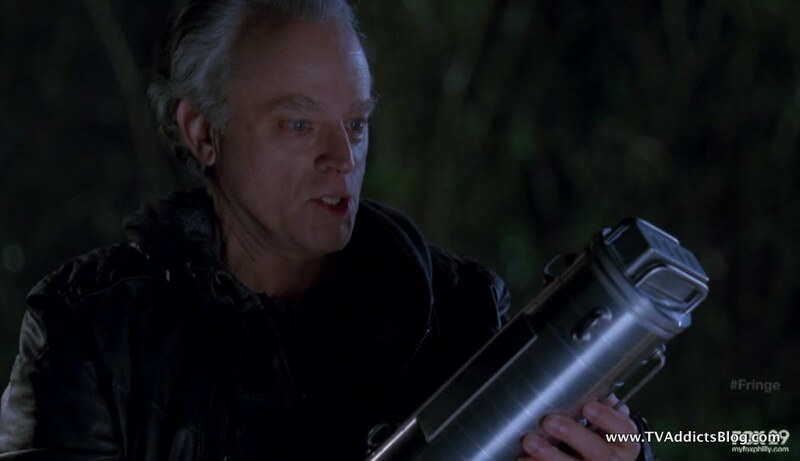 Peter realizes he should have realized Walternate created the bomb based on Walter's ability to figure out how it works. Yin and Yang. The Yin and Yang comment sets Walternate off. One man "broke" the universe, the other man did nothing. But his son was stolen, life stolen and ruined. Walternate explains that he came over on a mercy mission to ask for help in saving their universe. But, it was too late. 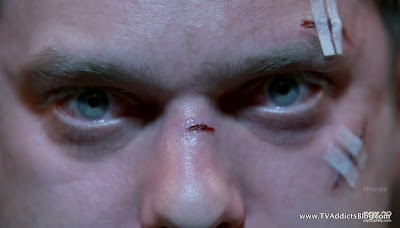 He blames Peter, his son, for destroying them all in a battle that he did not start. Peter retorts stating that Walternate activated the machine first with the intent to destroy our universe. Walternate explains that soon everyone over here will experience loss the way that everyone over there did. He said Peter will experience loss the way that he did. He's going to destroy the universe but not all at once. Peter states that he came to make a plea to Walternate. He apologizes for the suffering he has caused and for destroying his people (Peter's people too). He wishes he could take back that choice. However, it is no excuse for what Walternate is doing now. He is left no choice but to tell Walternate that he is coming with him...in handcuffs or without. Walternate then says if he was REALLY there he might not be able to resist killing him. WHAAT!?! Oh that's right, Walternate was a hologram! He insists he's going to start destroying Peter's world first with someone he loves. Then he disappears. Oh boy Peter, you sure fell for that one! Olivia and Ella arrive at Central Park. Ella can't get ahold of Peter. And then it happens, the light bomb goes off. Everyone is flat on the ground, Olivia wakes up and sees the vortex opening. 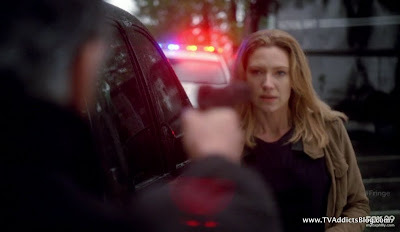 Walternate gets out of the car where he was portraying his holographic image, walks right up to Olivia and shoots her in the head. Uhhhhh.........WHAAAAT!?!?!?! Of course, we know this is the future, so we hope that this is only a POSSIBLE future. But still, whaaaaaat!!!??? 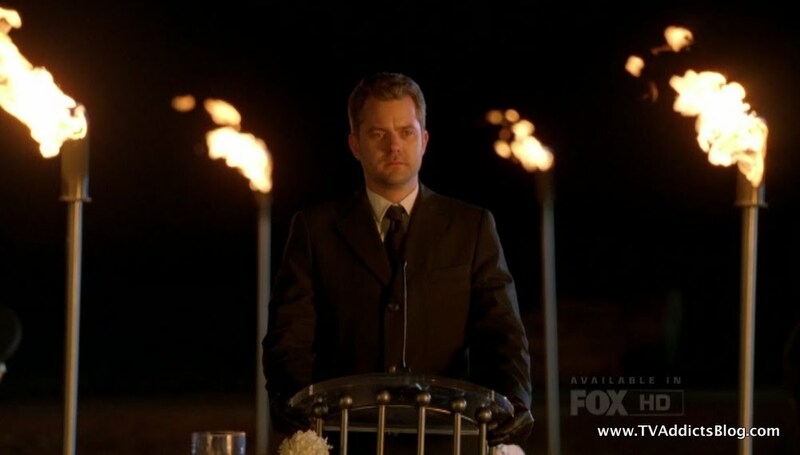 Peter gives an emotional speech about Olivia at her funeral. We don't get to hear much of it as we listen to Giacchino's soundtrack and see who is present. Broyles, Astrid, Ella, Nina Sharp, and Walter among others. And then Olivia's coffin is placed out to sea and burned. That is seriously old school style right there. Maybe there's a reason why they can't bury bodies anymore in the future. 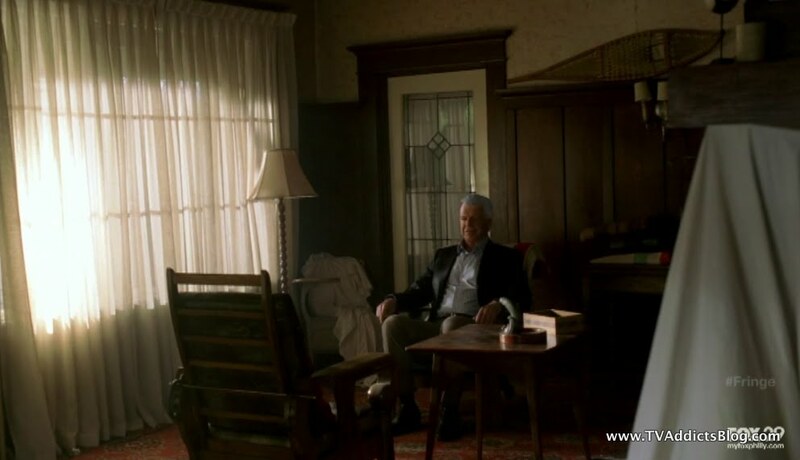 We have an additional scene of a grieving Peter back at the apartment. Walter and Ella have a moment on the way home from the funeral. They are still trying to contain the wormhole, and Walter requests to go back to his lab. While waiting for diagnostics to complete Walter tries to remind Ella how she used to call her Uncle. Walter professes his sorrow for what happened. He wished he could go back in time and make different choices. But Ella says that's not possible. Hmm, maybe it is Ella! Ella then does say that she remembered Gene the cow. Poor Gene didn't make it to 2026! Once the diagnostics on the wormhole were complete, Walter realized what must be done!! He goes to visit Peter and they have a very important scene that pretty much has set the entire course of events on Fringe in motion. And FINALLY, explains why the machine was uniquely built for Peter and Olivia to operate it. Walter says he was wrong and it's not too late. He unfolds the "ancient drawings" of Peter and Olivia and the machine. He said they can save both worlds. They can do it all over again but Peter just needs to make a different choice. And if something goes wrong then Olivia will be their failsafe (that is probably a key line to remember for next season). Peter has no idea what Walter is talking about and says that Olivia is dead. Walter argues that she won't be. And then it happens. Walter says he has been wondering during his time in prison where the machine came from (don't worry Walter, we were wondering much sooner than that!). What he didn't realize is that the First People are actually THEM! Them from the future! An ancient piece of advanced technology? Duh, why wouldn't it come from the future! Walter is the one that builds the machine. Perhaps Walternate builds the one OVER THERE? That doesn't really explain how a machine was built OVER THERE too. Unless Walter built 2 machines and somehow sent it to both universes. He realizes that he sent the pieces of the machine through a wormhole (to a prehistoric time like the Paleozoic era, yup the wormhole in Central Park). Peter suggests that Walter not even build the machine at all and then none of this would EVER happen. But Walter says that is not possible. He already BUILT the machine and it would be a paradox not to do it. Peter must just make a different choice within that already made decision. The logic here is a little flawed, but time travel always is! It works for me. Peter says that they must consider the repercussions. Walter looks at his son and says there is no way of telling what the cost might be but it can't be worse than this! We'll see, Walter! Peter asks what he would need to do and then all of a sudden we are back in the present timeline where we saw Peter open his eyes at the end of last week's episode. Peter is still in the machine and Broyles is starting to get concerned for how long he's been in there (60 seconds). His heart rate is increasing and Walter suggests taking him out now would harm him. They send Olivia up the steps to talk to him. Peter sees her and is thrilled she is still alive (indicating that he did indeed witness the future). Over there, Walternate and Brandon see the activity spikes in the machine and know that the other side's machine as been turned on. The soft spots are actually not closing, they're getting worse. 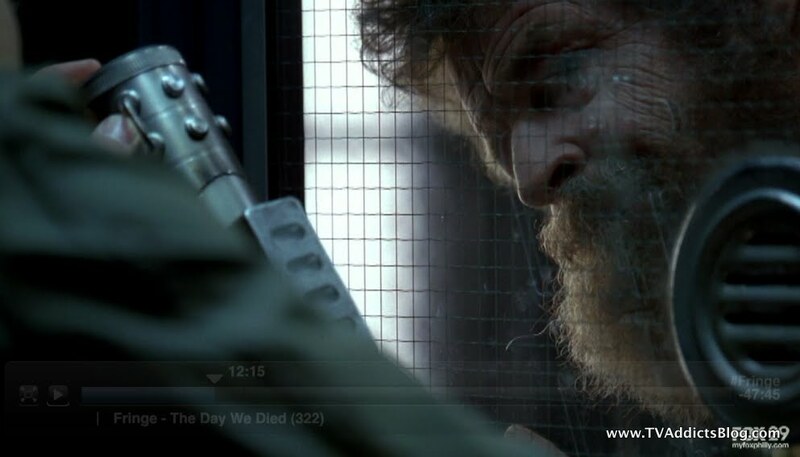 Walternate asks for Fauxlivia be brought out of her cell. Walternate brings out the "ancient" drawings and says that it suggests that she has a connection with the machine. (not true Walternate, she has no cortexiphan in her system) Fauxlivia just smiles and says the other side outsmarted Walternate. 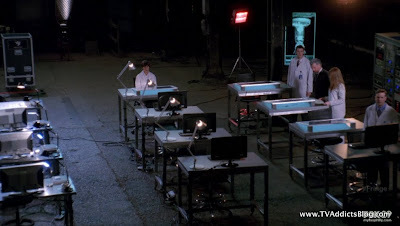 They know he turned the machine on, they put Peter in theirs and now they are the ones that are going to get destroyed. We see a glimmer of Peter OVER THERE. Over Here, Peter sees Olivia and knows exactly what he needs to do. All of a sudden, the people from the OTHER SIDE appear in the same place as the people over HERE. Walternate/Walter, Olivia/Fauxlivia, Brandon, Broyles and Peter. They're all in one place. The first thing we think of is what we've been theorizing all season...the worlds merged!! But, that might not exactly be the case. Peter says that the bridge was created so that they can begin to work together to fix.....and then he glimmers and disappears!!! But it happens so quickly and the conversation that follows happens so quickly that we can't even process it right away. Both Walters were looking in that direction and then face each other. By the way, this is the first time we get to see Walter and Walternate face off in the same place. And it's fantastic if not brief and an unexpected topic of conversation. 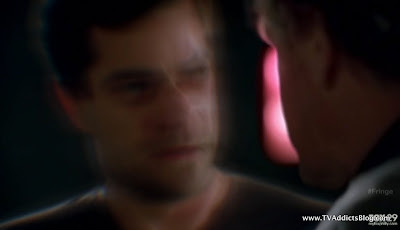 Walternate accuses Walter of shattering his universe. 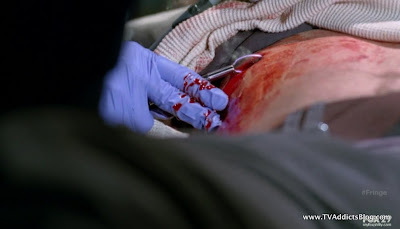 Walter claims it to be accident what Walternate has tried to do he has done on purpose. Olivia says whatever they both have done, they're here now. So maybe it's time they start to fix it. Notice that no one even talks about Peter or his disappearance. Notice that Walternate accused Walter of shattering his universe and not STEALING his son. Notice how awesome of a setup this is for next season! And then we got an eerie shot of the Statue of Liberty with all of the Observers witnessing huge event that just transpired. December (I think) says to September that he was right. They do not remember him. September asks "How could they? He never existed. He served his purpose." And then we all said....WHAAAAAAAT!?!?!?!?! Peter is gone? I probably said that for a couple hours after the episode trying to figure out how they're going to work this next season. Obviously, Joshua Jackson and his character Peter are a key figure in the Fringe world. So, there is absolutely no way that he won't be part of the show next year. We even have confirmation from the producers on that. So, before we go any further into our analysis, maybe we should stop and check out an exclusive interview that TV Line had with the producers of Fringe after viewing the finale. They intend to stay spoiler free but they dropped a few ideas our way to consider all summer. And yes, we're all asking the right questions! One thing is for sure. I can absolutely tell that Jeff Pinker and J.H. Wyman have a plan for Fringe. That is what makes me not worry about Peter disappearing from existence and everyone's memory. They have been laying the groundwork each season and there are key moments in episodes along the way that pay off down the road. They said they have an 8 season plan and I totally believe that they do! That's why I head into this hiatus without fear of Peter's character. They already know what they have in store for him and I have no doubt it will be amazing! And the best part of the finale is that we are left with big questions to ponder and discuss, just like another show once did for us. Here are a few I have thought of since the episode ended. What about Baby Henry? Does he even exist now? I cannot believe for one instant that they would introduce this storyline for Peter never to find out about it. I thought in 2026 that Walternate would have told him during their meeting. But, this is not the case. How crazy would it be that Henry still exists after Peter disappeared but no one questions where he came from? What about this man with the X on his chest introduced in Olivia's animated mind? She is convinced and content with the fact that this man is going to kill her. Did her mind somehow know that this X-man would exist in a different timeline than the one they were currently living through? Because, as we saw, if the timeline played out the way it originally would have, Olivia would be killed by Walternate in 2026, right? Of course, we are probably meant to think that the timeline we are watching is the end all, be all of timelines. The one that works! But if that's the case, why do none of them remember Peter?! God, I love Time Travel. Have I ever mentioned that? Did Peter really NEVER exist now? Or perhaps Walter never found a cure when he was a child so he died in both worlds? The interview on TV Line sheds a few teasers for next season on how everyone still could have met without Peter's involvement. Will people that have formerly been killed now be alive again due to different decisions in the timeline and no existence of Peter? i.e. 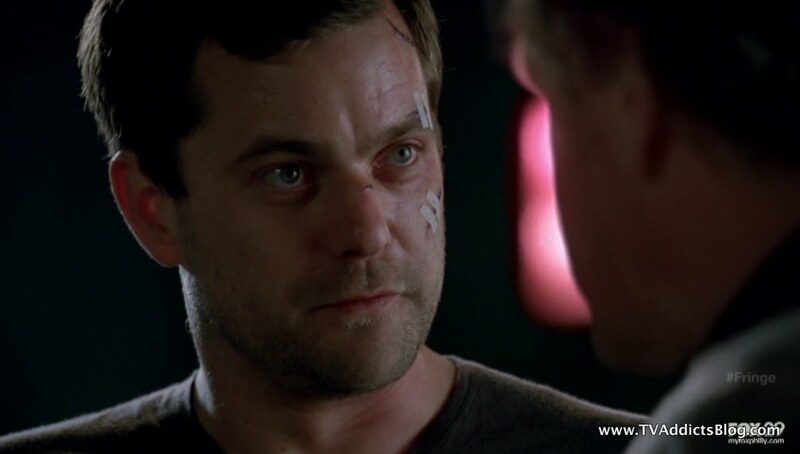 Will Alterna-Broyles be alive again because Olivia didn't go over there to save Peter? Maybe even Charlie on our side will still be alive? I'm thinking to avoid confusion they will keep those kind of changes to a minimum. But, clearly in a world where Peter doesn't exist, there are bound to be differences along the way. It could be as fun as we've had all season pointing out differences in the alternate universe. If Peter didn't exist then how would the universes still be at war? Walter never would have crossed over to the other universe and caused a ripple effect of destruction. The producers explain in the link above that Walter and Bell were already looking for ways to cross BEFORE the Peter incident, so it's likely that it happened another way. Again, all questions we're meant to be asking. I love it! There are tons of questions that I'm sure we can ask. And I'm sure that will please certain readers of this blog who were always looking for a little mystery in their Fringe! And we have a whole summer to ask them. Bookmark this page and we'll continue the commentary all summer long. (and try not to sing the Kid Rock "Sweet Home Alabama"/"Werewolves of London" mash-up song in the process!) One more thing to do before we sign off for the season! Glyph Code of the Week: NoMore - Well, I think that one is self-explanatory! How are we going to get through this summer!?! Thanks one more time to Fringepedia for the excellent screenshots of the glyph codes! Observers Spotted! - That's right! They were ALL there for the key moment of the series and to provide a cliffhanger of massive proportions! One still question remains and now it seems even more relevant. Who ARE these observers? Several of us thought that they would be tied to the First People. And it had been theorized that the First People might end up being from the future. The latest thing I'm thinking is that maybe the Observers are from the future too. Maybe one absolute and final future that outlasts any other timeline's future. They know how things need to play out for whatever outcome needs to happen. Are they from further in the future from when Walter (and Walternate?) build the machines? I don't know. I don't have it quite figured out yet. And it's just a theory. We may never get an answer on the Observers. They could just be "part of this universe (actually universes)" and we're not meant to question their existence. But, I hope that's not the case. Walterism of the Week: With such a dim outlook in the future, there wasn't much for Walter to get excited about. But when he heard about the Paleozoic era he couldn't help but show a little excitement over Sauropods! He also recalled a love for swivel chairs too and how much he also missed "swiveling"! And can I just say one thing? 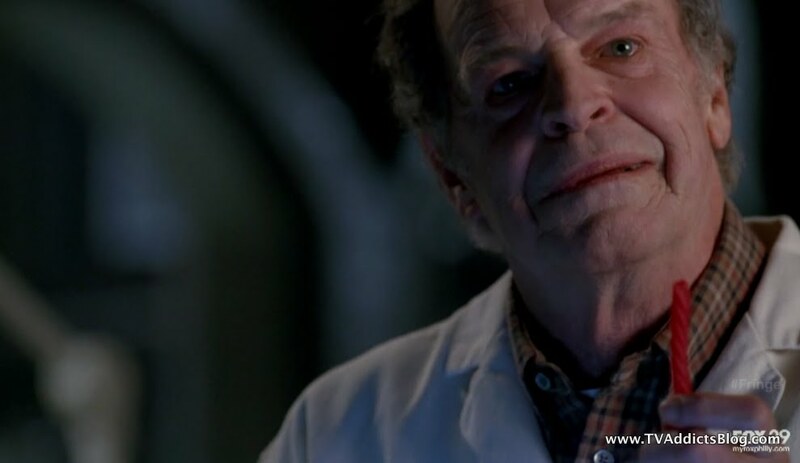 John Noble has done more than enough this season to earn himself an Emmy nod and victory! Let's make that happen please! Food of the Week: Peter stops by with a surprise for Walter. A whole bunch of Red Licorice! The future showed is some interesting uses of technology and medicine in the episode. Apparently each Fringe Agent has reserves of blood just in case they get shot. And they can seal up wounds with some crazy UV Cauterizer. Hey, whatever works! 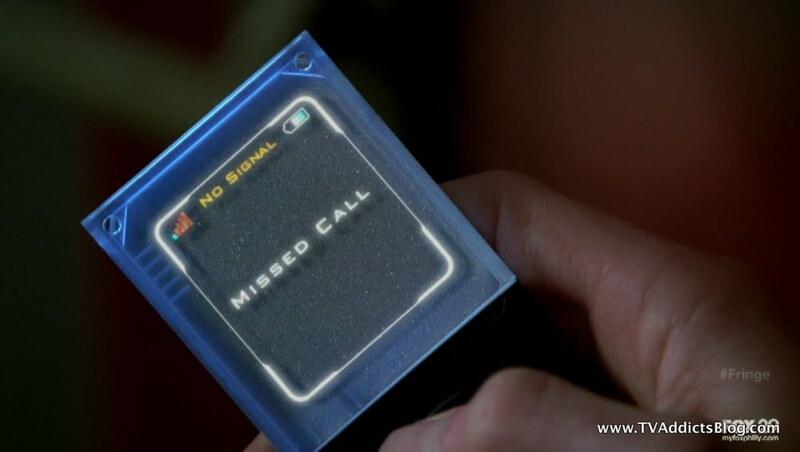 The cell phones didn't look too advanced though. They definitely tried to make them look different than today's but they sure seem bulkier! Not Zach Morris bulky, but still bulky. As we see with Ella, apparently it is not uncommon to have barcodes (temporary or maybe permanent) tattooed on people in the future for means of identification. When we witness another Vortex opening on the river Thames in London it is brought to us by a channel we've never heard of called WEBV. Perhaps this stands for Web Video and is a little sneak peak of where the television landscape is headed? I could be reaching there! 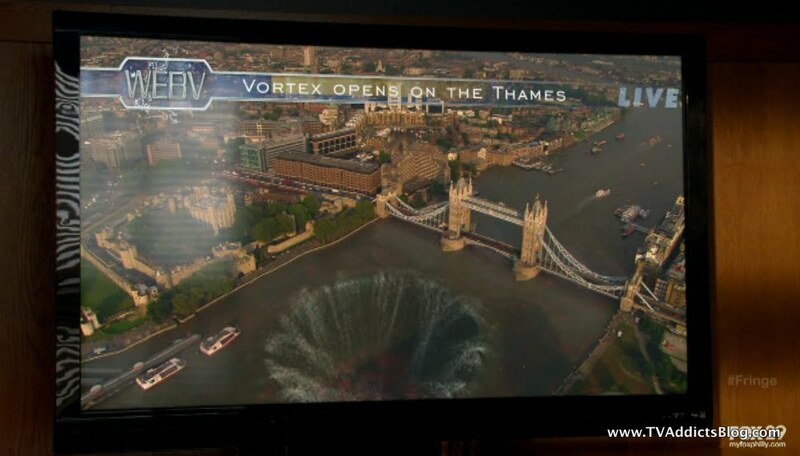 But it was an excuse to show a screenshot of the Vortex in London! As always, when witnessing a "new world" of sorts (past, over there, now future) the opening credits change a bit. This one is grey in color but the text of the Fringe sciences being investigated are entertaining as always. Of course there are also some interesting ones in there like "HOPE" which is something that people must be clinging to on a daily basis in this awful future! The food of the future is very interesting. Olivia was pouring wine out of a box and while that does happen today, you'd think that the head of Fringe Division wouldn't be doing such a thing! And how about the canned steak!? That's fantastic. Perhaps it all has to do with the universe being destroyed that the food they eat has been preserved for a long time. Maybe Gene sacrificed himself for this canned feast of theirs. Say it isn't so FRINGE writers!!! Umm...they have HOLOGRAMS in the future! And we don't have to wait for the 24th century for them either! 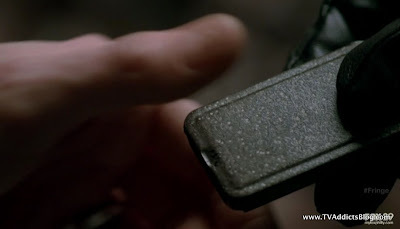 (Yes, a TNG reference) Surely, that's the next evolution of Television and Movies after 3D, right? At least, that's what I always joke about. So that's all I have folks. What a fantastic way to exceed our expectations and make us use those noggins attached to our bodies. A great season capped off by a captivating and head scratching finale that no doubt opens a realm of possibilities for what season 4 will look like. 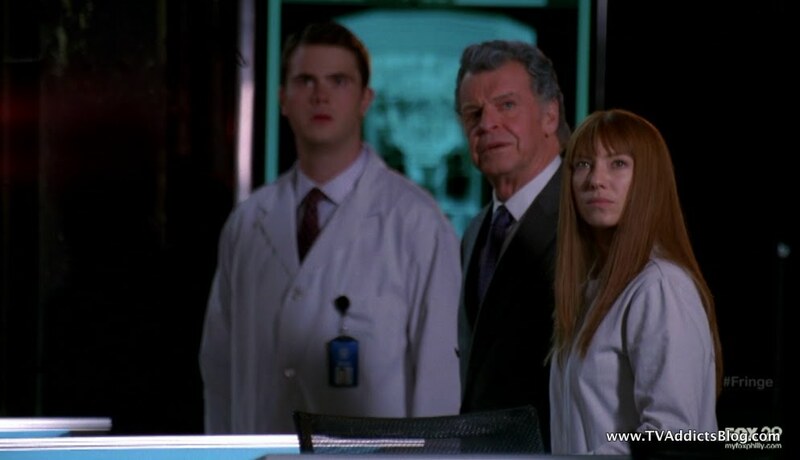 After reading a few recent tweets, it sounds like this episode may have polarized the Fringe fan base. Maybe that explains why I lost a couple followers when I exclaimed that this is truly LOST's heir in television. But hey, I believe what I believe. And hopefully all that read this blog enjoyed the episode. I will make my plea one more time to you all to get your friends and family into this show! Clearly the producers have a great vision in mind, and it would be great for them to see it through to completion! Summer prospects of TV blogging? I'm not sure yet. I usually like to take the summer off. But I may post up quick posts to discuss certain shows like Breaking Bad, Rescue Me, maybe Game of Thrones. We'll see how things go. There are lots of prospects in the fall too for new shows. Alcatraz, Terra Nova, Grimm (by LOST writers Eddie Kitsis and Adam Horowitz) among others. So stay tuned to the blog and if you see anything interesting for the fall that you think falls into our wheelhouse, let me know and I'll see what I can do about blogging! 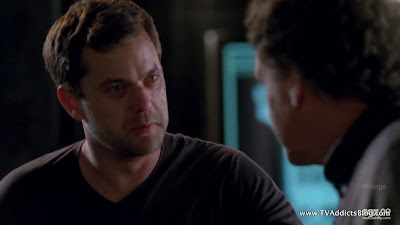 And with that, I sign off for Fringe for season 3. Hope you enjoyed my efforts at recapping this show. I have certainly increased my interest in the show since starting the blog and have no regrets! Hope you enjoyed my ramblings and I'll see you in September for Fringe and sooner, I hope, for other shows! 17th Precinct - "Adult Harry Potter-like" show with Magic and Cops and stuff. By Battelstar Galactica's Ron Moore. Again Mike, thanks. This was a great ep. One that will need rewatching with producer and other comments to understand as much as possible. While I'm not convinced we're in the final choice that Peter makes, we may be. Certainly he will have to become involved with the other main characters at some point. 1. In the picture on the refrigerator, the child was holding only Peter's hand. I don't know if that matters now in this possible future. 2. 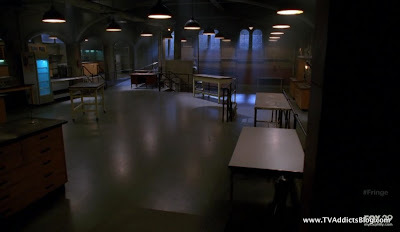 The Observers were likely at the scene where our 4 main charcters were talking after Peter left. But I'm not conviced of it. There a many possible futures. 3. Is Bell, Nina and Weiss alive in this future? 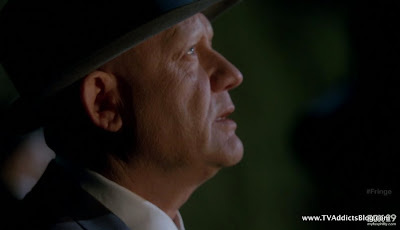 It's like Bell never existed and yet he was so important for Walter to be successful. 4. I would like to know when Walter built one or both machines. he built them for a reason. We still don't know why he built them. 5. 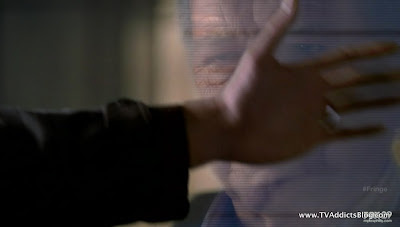 Bell and Walter did have the ability to see into the other univers through that TV screen. That's how they got some of their inventions. 6. Did Walter develop the machine before he had pieces of his brain removed? Since it's there in Walternate's lab right now, it had to be made earlier. 7. I really liked how Fauxliva and Olivia were analyzing each other. Got to go now, will add more later. Again, thanks. BTW, my daughter is now watching with me. and what about Sam Weiss? Ronn - I don't think everything is clear yet on what this new world is. Yes, it would seem that it's a world where Peter never existed...but it's not a "MERGED" world. Only that spot (Liberty Island) is merged based on what Peter said. As for Sam Weiss...his ancestors still had to discover the machine documentation and pass down the information from generation to generation. I think we'll notice slight differences from where Peter would have interacted with things...but apparently, events still would have transpired similarly. I'd read the interview I linked to from the producers. They give some tidbits to where things are going. I'm excited to find out what happens though! @Richard I'll get to your comments next. 2.) I don't think that there is any doubt that the Observers were at that scene. Not at all. I don't think they'd try to confuse us too much. 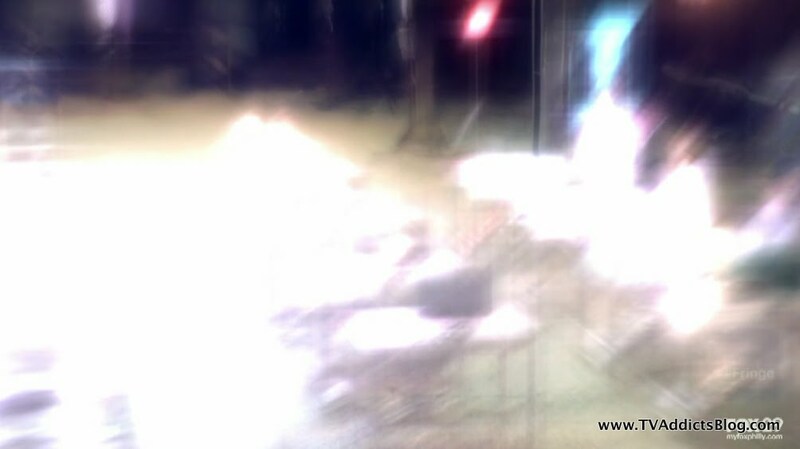 Peter didn't exist inside and the Observers referred to it outside. 3.) Bell definitely existed in this new timeline based on what the producers said in their interview. Whether he's still alive or not is difficult to tell. But if he didn't assist in getting Peter, Fauxlivia and Walter to our side at the end of Season 2 he may never have died. Interesting thought. As far as Nina and Weiss...I assume they're still existing. But we'll see! 5.) 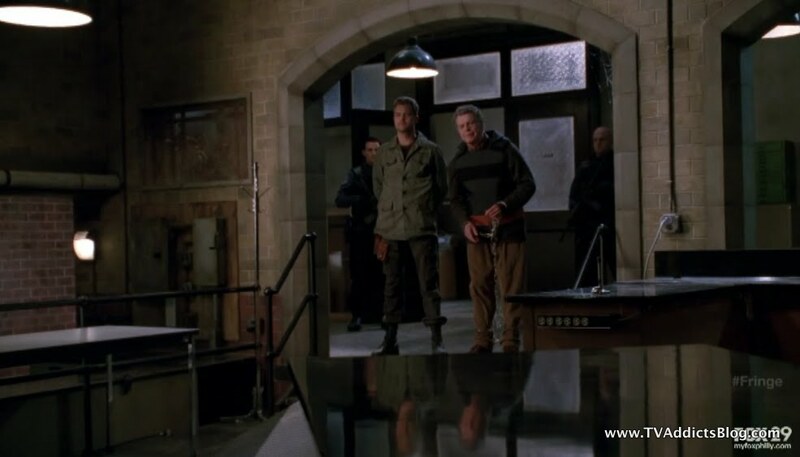 Yep...they were already trying to find a way to the other side before Walter went over and got Peter...so it happened in a different way in this timeline. 6.) no...he built the machine IN THE FUTURE!!! At least that's the impression I got. I know he said "i already built it" but i assumed he meant he already built it in the future to send back to the past. That's why Peter was saying don't build it....but Walter said he HAD to because it would be a time paradox if he didn't. 7.) Yeah the analysis of Olivias (who already had met in the original timeline) was interesting. 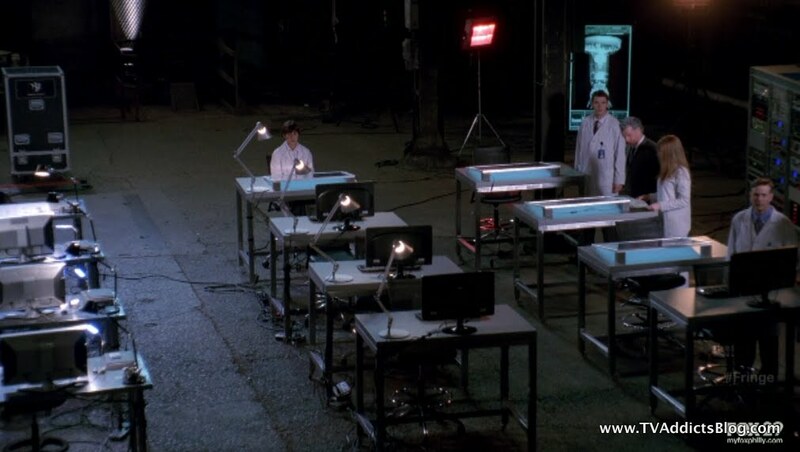 But they were analyzing each other before Peter disappeared too...it was all very interesting. I'm interested to see how they all work together to save the worlds lol Surely there will be some animosity there. And surely, it's not the end of Baby Henry...unless that child was just a means to an end to activate the machine OVER THERE. Then again...if Henry didn't exist, did Walternate not initiate the machine over there causing our side to operate the machine over here? Surely, they're going to question why the machines were working in the first place if Peter doesn't even exist! Unless in this revised timeline...Olivia is the one that operates the machine. Something is definitely going to have to be course corrected...right? i rewatched it again, yeah it seems liberty island just became the merged spot for both universes. When was the exact moment that the new timeline (peter never existed timeline) started? is it right exactly before Walternate said "you shattered my universe" OR the moment Peter found back his consciousness talking to Olivia? His sudden disappearance doesn't make sense if the new timeline started when he found his consciousness right? Notice when Walter and Walternate was looking to Peter and then he dissappeared and looked at each other? Could it be the start of the new timeline? they're back on SEPTEMBER right? What I was thinking was that it may have taken "time" a little while to catch up with what Peter had changed. So by changing the course of time and creating this bridge, Peter was no longer a necessity because that version of 2026 future does not exist anymore. So, for that initial moment Peter was still the Peter we always knew, Walter, Waternate, Fauxlivia and Olivia were the ones with the memories we always knew...then TIME corrected itself once Peter disappeared...and we were witnessing the NEW timeline. One where Peter does not exist. So the crazy thing is....how did they all end up in that place to be arguing? Will they have a different memory of how they got there or just not even know how they got there? Something makes me think that there will be a trail of evidence of the existence of Peter. I'm not sure how he'll resurface...but surely they will eventually remember what he's done if he does come back. It's definitely an exciting cliffhanger!!! And yes...Peter was definitely not done with his explanation, time just corrected itself and he was no longer there. And then the Walters were just staring at nothing with their "rebooted" memories...lol It's crazy stuff! 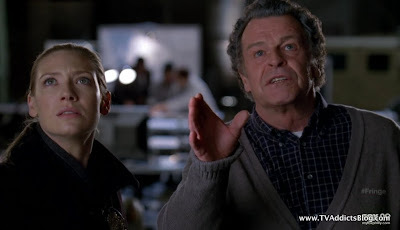 I'm interested to see how they'll get into "FRINGE CASES" in the next season. We could see both sides teaming up to solve cases and to find a way to save both worlds. I love it! But, probably a longer subplot will be however they're going to work Peter back into the show. I'm excited! And yes, season 4 will most likely be back in September. I just hope it'll be back with more viewers. But, I think that ship has unfortunately sailed. As long as Fox stays in its corner, we should be ok. But we'll see! Can't agree more, a trail of evidence perhaps will bring him back. Something like the blueprint of the machine with his face and Olivia's? The first people books that Nina has? Sam Weiss himself? Olivia? 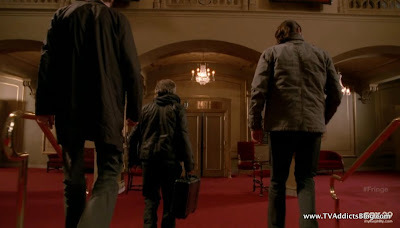 And yes, the question of how did they all end up in that place makes it matter for season 4 to start in that very moment. Errr this is the worst hiatus EVER. Agreed Ronn. Involvement from all the key players will somehow play a role in figuring out what's going on. While it's going to be a rough hiatus. I'm going to go with LOST's season 3 finale "We have to go baaaaack!" and then a 9 month hiatus to follow for the first January season premiere of LOST. Whew...that was painful! lol At least here it's only 4 months. Still, a long time to wait. But plenty of time for people to catch up on seasons 1-3 and create new fans! Some more thoughts. And welcome Ron. 1. ARe you jazzed up enough to have a Fringe website/blog, like you did for LOST? 5 more seasons. BTW, I have not read the link to TV Line yet--I'm trying to think through this without the aids, at least for now, thanks for posting. 2. Peter can't really move into the new timeline permanantely--he's still in the machine on our side in 2011. BTW, which is going to be "our side" now--with everybody in Red land? 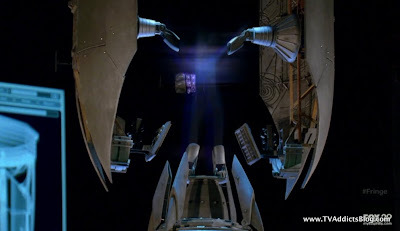 The machine allows him to create/destroy portals and worlds, while he is protected in the machine. It doesn't make sense that everyone has totally forgotton about Peter as if he NEVER existed, since he did--such as Olivia's niece and Walternates/Walters wives. The documentation that Walternate has shows Peter involved with the machine. 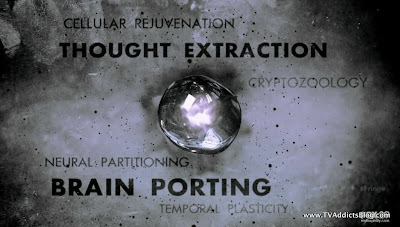 Of course if everything about the Machine and Peter is totally changed, than the Paradox has changed. Of course Olivia can be the prybar, but at the last minute for Walter saying she can operate it fully is major league cheesy given the last few seasons. It's like--OH, let's do a write in to fix a problem we have with the script. But, the machine on our side still should have Peter in it and he could open another portal to show himself. 3.Peter and all the people in blue land will still be about their business trying to save the world and deal with the issues of the world tearing apart--at least that's what makes sense based on what's happened so far. 4. It doesn't seem like there was any time travel involved in the red world. Walternate had Fauxlivia brought up from her cell and they were still dealing with the same stuff(or so it appears) when Peter showed up with the calvalry. 5. Since Peter should be alive in blue land, then Henry should be alive in red land. 6. If Peter is just lost into limbo, than that's pretty cheesy since he is supposed to be able to choose what happens on several fronts. 7. I would really like to see the eps surrounding the original machine build. 8. 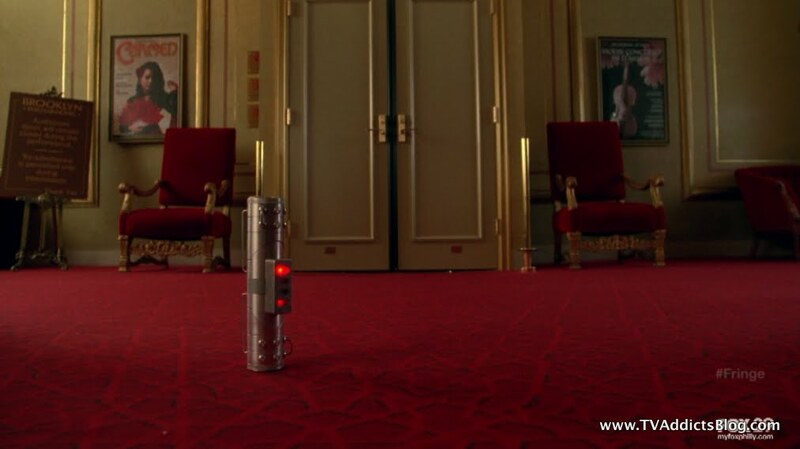 If Walter and all are SO smart that they made this machine and took it back into ancient history it makes a lot more sense to just have Peter go back in time and get Walter and Bell (Walternate too) to not destroy each other. Walter going back in time changed history. You know, maybe he belongs in jail--LOL. More to ponder. Richard I don't have much time to comment right now but I think we watched 2 different finales. They didn't move over to the red world. Lol they merged into one location. (ie liberty island is now a bridge between the 2 universes. ) I don't even think that is up for speculation. As far as time travel. Huh??? There was no red world time travel because the red world was destroyed in 2026. It didn't exist. But Walter must have built 2 machines and one got sent back to each universe. I dunno. As far as a fringe blog. Naaa I created this site as a one stop shop for all tv shows so I don't have to keep buying new urls and stuff. It might help in weary engines if it was for a specific show but im okay with it here! I'm saying the show ended in 2011 timeframe. Which was when they were right before meeting with the red world. Well, I could see why you thought of a merging. But he said specifically that it was this one spot where he brought together portals. That one spot does not make two worlds merge, beyond that spot--imho. I'm thinking he put them in the red world since it's in the worst shape and survival will take cooperation. I thought the first possible future was the true complete merging. Well, now it's getting good when 2 pretty knowledgeable fans look at the "mysteries" with a different viewpoint. Yea, URLs can get costly when you keep adding and maintaining them. Thanks for the pic of the opening, I saw dual maternity and couldn't see anything past that. do i have to start from season 1 episode 1 to get a full understanding of everything or can i just skip to a certain point. 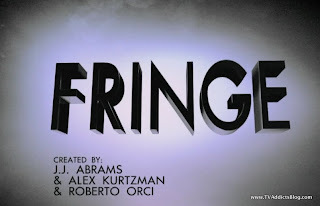 i've never looked at fringe before but am looking to get into another series. is it serialized or episodic. thanks in advance i always read your flash forward reviews and the event reviews but now i'm looking for other serialized shows. shows i can recommend to you is nikita and the killing. i think both of those are excellent shows. 1.) I answered this one already. Cool with thinking through before reading the link. And yeah I'd love to have a Fringe site too but like I said...too much maintenance! Plus, I like the idea of a one stop shop! 2.) I really don't think everyone is in Red Land. Peter said he created a hole in both worlds that led to THIS PLACE. A Bridge between universes. Plus, the observers are looking at the green lady liberty at the end. I dunno, we'll have to see how it all works out in the end. But I think both sides can easily go back to their worlds. And the plan is to start working on a way to fix BOTH worlds. So, the biggest problem besides that will be everyone remembering Peter. I think you're getting confused about the Red world not being impacted by the changing of time also. The pictures included Peter BEFORE he changed things. We have not seen the pictures AFTERwards. It may be totally different now. I think Olivia is now going to be something more than the crow bar. Future Walter talked about if anything went wrong Olivia can be the FAIL SAFE. So what went wrong? Peter disappeared. Now Present Walter just has to come to that realization too and then somehow use Olivia's Failsafe key..whatever it may be lol Just a thought of mine. 4.) Disagree with this and my points are above. 5.) Disagree. If Peter never existed there is no Henry. We have to take September's word for it. "Of course they don't remember him. He never existed. He served his purpose"
6.) I guess...I really think he doesn't exist anymore but something will have to be change to WILL HIM BACK to existence. And I think there will be some kind of evidence that he did exist. 7.) Again, the machine was built IN THE FUTURE! So we'd have to see flash forwards of Walter building the machine. It is confusing because Walter kept saying "i already built it" but he meant that in future tense. Like a Whatever Happened Happened type of thing. He already built it because we know it exists in the past. But he said "that's why I have to build it again"....meaning he still hadn't built it in that timeline yet. But now he knows he is the FIRST PEOPLE from the future and will have to build it and send it through the wormhole. I'd like to see the building of the machine too...but I"m not sure that will be the focus. 8. 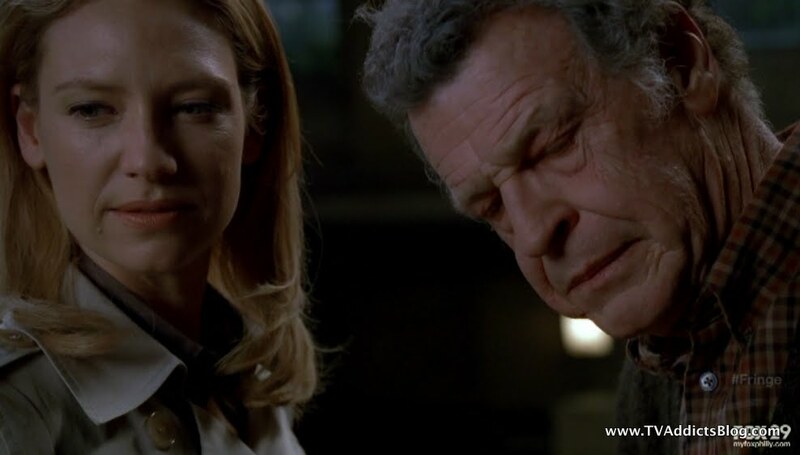 I think you think that Walter built the machine in the past and then had his memories taken away. You must remember that the wormhole did not exist in the past. It exists in 2026. That is when the machine is built and sent back. Unless you think he built the machine and hid it for 20-30 years and then found it and sent it back in 2026 lol But I don't think that's the case! I'll get to the next comments next! That's for the Flyers sympathy..it just wasn't their year! 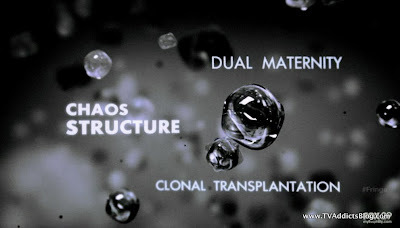 @Gnni - yeah...WTH is Dual Maternity!??! lol No problem on adding the pic! @Joshua - Welcome!! My recommendation, to not miss a single thing, would be to start at season 1. There are great reveals that I could easily spoil for you to start later but they are GREAT reveals lol. But no, You could probably watch the Pilot episode of season 1, and then maybe the last 3 or 4 eps. Season 2 is fantastic, but you can probably watch some key episodes there that I could look up and let you know. A few from the first half, the entire 2nd half...and then all of season 3. It's really great. The show started off more Procedural than Serial. So there are some self contained episodes....but there is always a back-drop of advancing the overall mythology. By the middle of season 2...the "Case of the Week" started being very relevant to the overall mythology. So it got more serialized. This season...if you weren't on board for the whole thing, you were going to get confused! I'm glad you're thinking of branching out. You have all summer, so I suggest just running through all the eps! S1 starts a bit slow, but I assure you it gets really good! Thanks for the link. I've read some of the other stuff too. 1. Well, one thing we know for sure, the Observers are totally wrong, Peter did exist. 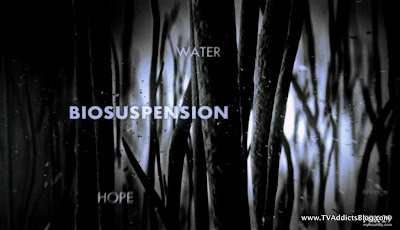 There's a big difference between being put into biosuspension or whatever vs never existed in ANY world. If he never existed in any world whatsoever that's like saying season 1 to end of 3 didn't happen with him AT ALL. Maybe that's what they want a totally new reboot that basically takes what we learaned the last 3 seasons and throws the Peter portion away. That would be very frustrating for many. That's one reason why I think having Peter in another world or something makes sense. But hey, the link you posted sounds like they're hoping for a complete redo sans any relationships involving Peter(especially with Olivia). Of course that would mean that Walter did not take Walternate's son, etc. So, the issues between them would be based on a totally different reason that Walter would have to have for tearing apart the fabric between the worlds. 2.HOnestly, they need to be careful with a reboot imho. 3.There would be NO reason whatsover for anyone to try to bring back anyone who never existed. If he never existed of course he would not be in any of the paperwork for the machine nor would the machine have been built for him--I think that's what you're saying? 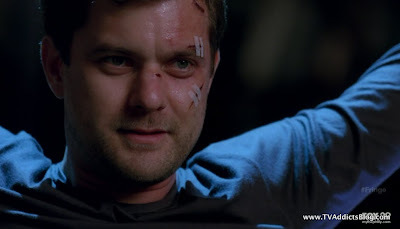 4.Since they can't bring him back(by definition), I wonder how Jackson or what role Jackson will have next season. Maybe he'll get a name change(I know they won't do that)--lol? One thing could be that both Walters go back in time to the point when they were young, get married and birth a Peter--lol? 5.What year do you think they are in at the end of the show when they're all gathered together--before the Observers shot? 6. I don't think we know when the machine was built, except in the future vs 2011. I was thinking that Bell could have been involved in various ways now that we have time travel. 7. For an ep that supposed to be so straight forward this one sure isn't on critical points. For example, if a person hasn't read all of the associated blogs, interviews, etc by the cast/writers/producers--how could you KNOW(again without debate) that this was a reboot. I'm sure a lot of people thought Peter was suspended somehow in a differnt plane of existence. I sure did and I thought you did too originally. I can't wait to see how they deal with it. But I will certainly miss Peter and Olivia. Hey, maybe I can get my wish and they'll work in Taylor Cole--lol. hopefully they are done with TIme Travel because it just never works out well..and since Time Travel was apparently "invented" in an alternate future, it may not exist going forward.. So on to your comments. 1.) The Observers are not wrong per say...obviously THEY know he existed...but in the current timeline that Peter caused...and in the minds of the people there...he never existed. Things don't have to be taken so literally so that we say someone is wrong! lol And I think existing in a "WORLD" is the incorrect terminology. (speaking of taking something literally lol)....it's really existing in a TIMELINE that matters here. One thing we know is that seasons 1-3 had to happen to get to the point we are at now. So Jackson may look at it as a "REBOOT" but I don't think that's really what's going on. It may SEEM like a reboot for the beginning of season 4. But I think there will be evidence left behind of Peter's existence. And the key phrase was Walter in 2026 saying that Olivia will be a failsafe if something goes wrong. Peter is not gone....but it's certainly an awesome cliffhanger to make us wonder how he'll come back. 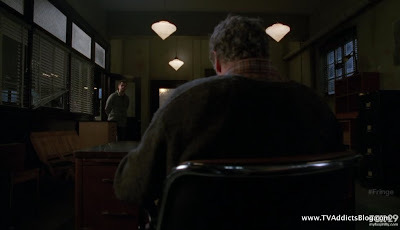 And yes...as I mentioned in comments above...the producers stated in the article I posted with the blog that Walter was always looking for ways to cross over...even BEFORE he did it to get Peter and cure him. So, he and Bellie may have done it another way. 3.) The only reason would be if they discover evidence of his existence and realize something went wrong and realize Olivia is the failsafe when something goes wrong. We have to remember that Walter and Walternate are GENIUSES beyond comprehension. They may be able to pick up on something being "off" based on some fringey sciency event going on lol Yeah...I was saying something about the machine possibly not being built....OR it may have been built but now for OLIVIA to be able to use. who knows? 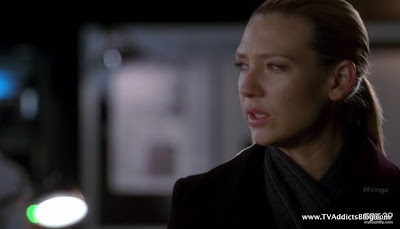 One thing we haven't discussed is how strange Olivia was acting after Peter disappeared. Her 2 lines of dialogue seemed very cold and robotic...didn't they? I wonder if we'll be seeing yet another version of Olivia in the beginning of season 4 lol Of course the question is...if the machine was never built...if that drawing doesn't exist....how do the Walters and Olivias all end up in one place at the end of that episode? Sure...we know why...but do they know why they're there? And are they there for a DIFFERENT reason than Peter bringing them there now? Maybe that, in itself, will be the catalyst that makes Walter wonder what happened. 4.) I don't think we're going to see people time traveling left and right now. Like you and AUSW said...they need to be careful with how much they use that or else things can get really messy. (continuity-wise) Of course...Time Travel would seem to be the only solution to get Peter back. but considering he doesn't exist now...i don't know how you alter time to make him exist again. As you point out indirectly...we don't even know if Peter was born or not. The observers say he doesn't exist....(in this timeline)...so it would seem to imply he was never born. BUT....if we don't take it so literally they could mean he never existed at that moment in time. Maybe both peters died as a child. I dunno. 7.) Well, to begin with...(or conclude with)...my mind may have been blown away by the finale. But I knew EXACTLY what went down when it was over. I knew that they altered the course of time and thereby made Peter non-existant. I think the episode speaks for itself with that. I've watched that last 15 minutes like 5 times now...and it's very clear to me even as it was that 1st time lol The big question is WHAT DOES THIS MEAN? What will next season look like? How and in what form will Peter return? People don't have to read additional sources unless they're THAT interested in knowing a few more clues before season 4. But they're really not revealing much. @AUSW - Here we go pulling your disappointment with the way LOST ended into things again. I will keep saying this until you have acknowledged you read it. J.J. Abrams is just a figurehead on these shows. Yes, he helped develop the original concept of the shows...but the showrunners give them life. Therefore. Damon Lindelof and Carlton Cuse outlined the bible of LOST. Jeff Pinkner and J.H. Wyman are outlining the bible of Fringe. While they may have interests in similar concepts...their shows are executed much differently!! And the rules of time are being used differently too. Pinker and Wyman are creating a show that answers questions quickly and delves into new questions that result from those questions. 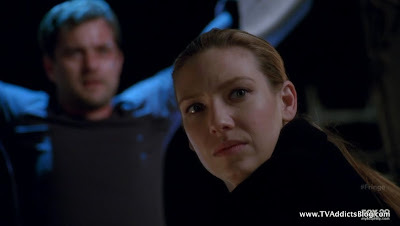 LOST introduced questions that lingered around for awhile (sometimes, yes, never answered). LOST is a mystery show. Fringe is not intended to be AS MUCH of a mystery show. But there are definitely season long "what's going to happen" type questions. 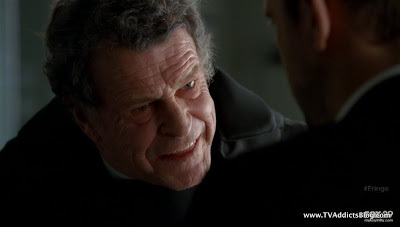 And surely, a cliffhanger of this proportion on Fringe is going to introduce a lot of questions too. As we can see by the comments on this blog. I can probably argue back and forth about Jughead forever...but since this is a Fringe blog maybe we can save it for an "offline" discussion lol But I will say that we don't know for sure that the bomb actually went off. All we knows is that when Juliet hit the bomb...everyone went back to the future. We also know that Desmond was exposed to large amounts of electromagnetism AND radiation. There is a chance that the Hatch was sealed off with the bomb still down there. I dunno. I'll have to look up Jughead in the encyclopedia when I go home to see if they say what the end result was. Maybe even LOSTpedia talks about it online. I agree with you though...I don't think they're going to OVERUSE Time Travel on the show. They may need to to get out of this current predicament. 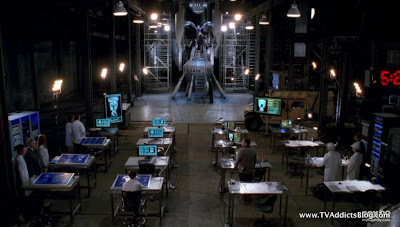 (one they're unaware of at this point) And yes...the machine..not sure if it's there or not. So if it's not there....then these people have to wonder how they all ended up in that room. How else would they have gotten there? How was this bridge between worlds created? There is already evidence of Peter's existence if the answer to these questions are that "Peter" caused them. He served his purpose. He created a bridge between worlds...he got both sides talking about saving the universes instead of destroying them. Can't wait to see they go with this! 1. I'm glad you said 2011 as the time frame. Earlier I thought you missed that one when you disagreed with me on earlier posts. 2. So do you think THIS liberty island is in red land, blue land, a whole new land? We agree that it's not in a different timeframe. Both red and blue lands still exist, since they're trying to save BOTH. 3.You're saying Peter did exist and that he does exist and it's not really a reboot and the actors don't really know since they don't write the show. Doesn't this prove my point, that an ep which is supposed to be so straightforward that even those involved with the show, aren't really sure of what happened-lol. Great recap as always Mike. I haven't read the comments yet as I don't have time - will catch up eventually but I apologise if I am repeating what others might have already said. Funny - I've seen Brad Dourif in so many things and love him as an actor, but I have not seen his big 2 (Deadwood and Dune). 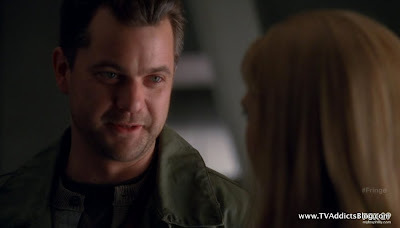 He was long ago on Babylon 5 - one of my fave scifi shows in the world. They were the first to do the 5 year story plan and they did it well. and now he is getting the entire blame for what happened' I thought they were blaming Walter because he was the one who first crossed universes and took Peter. That is what really started all of this. 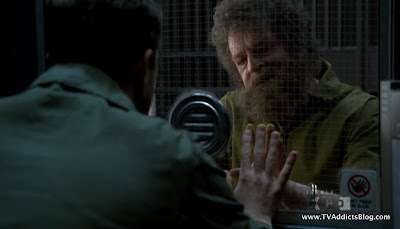 No that it matters now, but during the show I was ticked that we put Walter in jail but not Walternate. Hologram Walternate was awesome ! Did not see that one coming. But sure was freaky to see Olivia die. Just freaky. 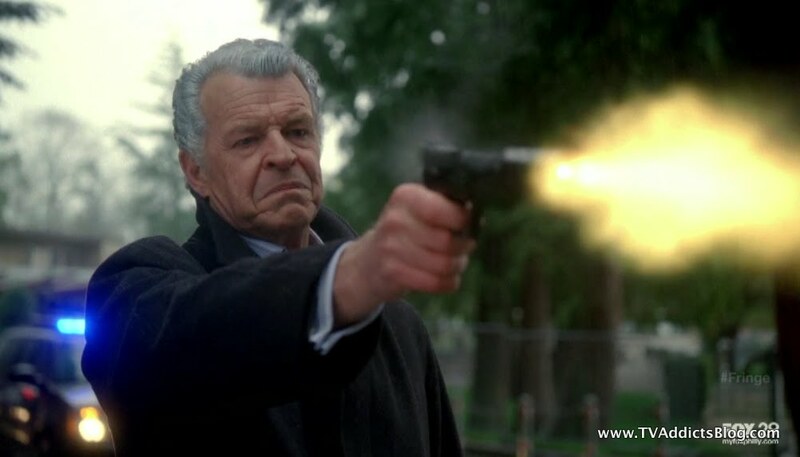 That shot to the head reminds me of another haunting death from NCIS years ago. he did not father a kid with Fauxlivia. Cannot wait to see where they will take us. What a great ride this has become. 2.) I think Liberty Island still exists in both lands. (blue world and red world)...so the observers were all in the blue world I guess. BUT....Peter referred to "THAT ROOM" (under the statue of liberty) is a bridge between worlds. 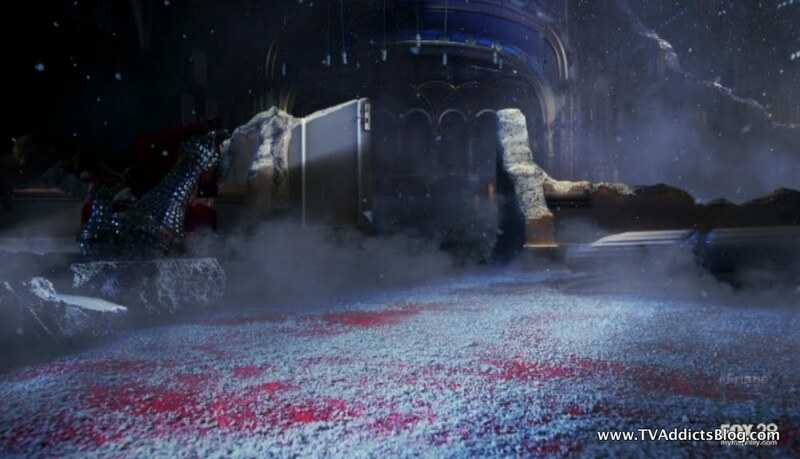 I guess there will be 2 doors or something and one leads to the red world and one to the blue world LOL I dunno! I'm sure we'll be filled in on how that works next year. 3.) 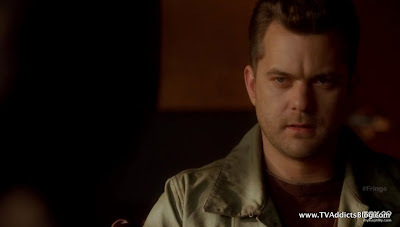 I just don't like the wording of REBOOT....Joshua Jackson can say it all he wants. It's still progressing the story of Fringe. It's not like starting over from scratch! But what we all agree on...is that the future is wide open. There is an entire world of possibilities of where this show can go next...and that is by design. So if the actors are suggesting one thing is going to happen...and we're suggesting something else....I don't think that's an issue with the episode not being straightforward. That's a testament of the finale being so well plotted and executed. We totally get what happened....but we have no idea where it's going. That's the biggest thing you want to accomplish as a writer I would think. But we'll see! @MJ - Thanks for the props! I hear you on the comments. There is some good discussion there so catch up whenever you can! I do recall you giving mad props to B5 ...and didn't realize Brad was on that as well. Good stuff. Yeah you're right on the Walter "blame" thing. I don't remember if i figured that out as I was blogging or when I thought about it afterwards lol But yeah...he was definitely blamed for initially crossing over. My bad! Good point on Walternate not being in jail. It wasn't clear if Walternate was a free citizen of our world or if he had been evading being found for all of these years. It seemed like they were all aware of him being there and it was of no concern. But yeah...you'd think he'd have some explaining to do too! Cool that we are both thinking along the same lines with peter never existing or dying young. And I think we're meant to be asking these questions. 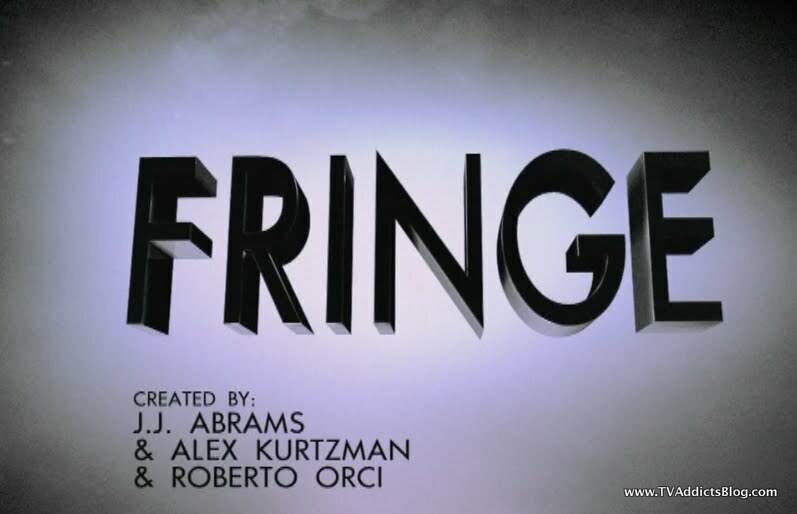 And totally agree...Fringe has really come into its own...and has established itself as a fantastic series. Of course, we were saying that at the end of last season...but now it's even more solified. I can't wait to see what happens next! "Fringe | I know that series bosses Jeff Pinkner and J.H. Wyman gave fans plenty to chew on first with Friday’s season finale, and immediately afterward with their TVLine “debriefing.” But one vittle I saved has to do with the nature of the “bridge” that Peter created to connect the two universes (as opposed to destroying them). Wyman told me that moving forward, the room there inside the Statue of Liberty will serve as “sort of an airlock” via which VIPs can cross to and fro. “You go out one door and you’re in our universe; you go out the other door and you’re in theirs,” he explained. But despite its location within a landmark, this “bridge” won’t be getting added to NYC tourist maps. “No,” Wyman confirms with a laugh. “It will be a well-kept secret.”"
The "Fringe" Season 3 finale took us 15 years into the future. 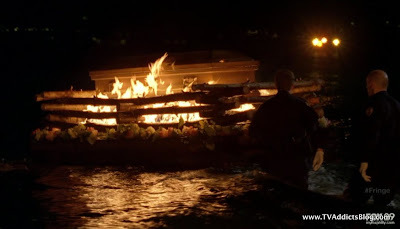 The year is 2026 and Locke is dead and Jack says we have to go back ... wait, no. It's 2026 and the alternate world is destroyed. Walternate is trapped in our world and is exploding wormholes all over the place to destroy the world that destroyed his world bit by bit, including shooting Olivia in the head. You're far too kind, MJ! But thanks for the props again :-) That definitely is funny. It's hard not to draw comparisons to LOST when they do a whole "Flash Forward" and "Consciousness Time travel" lol Of course...those were really cool parts of LOST so any chance to revisit them on another show and using them in a totally different way is fine with me! 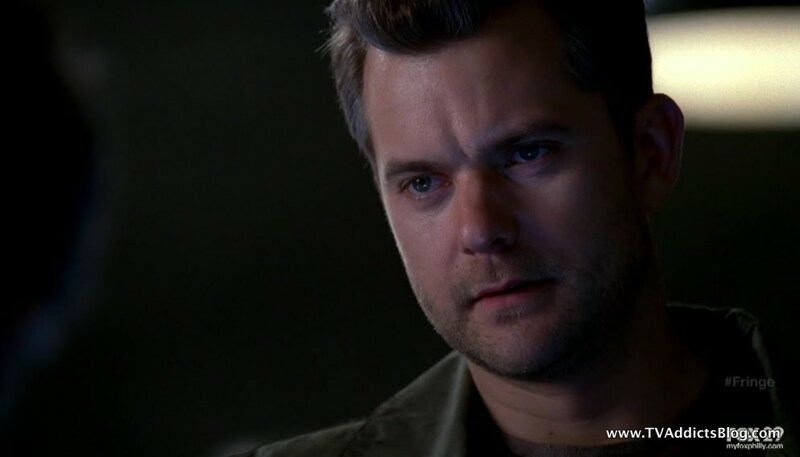 Joshua - I watch Nikita and have been enjoying it as well as Killing. 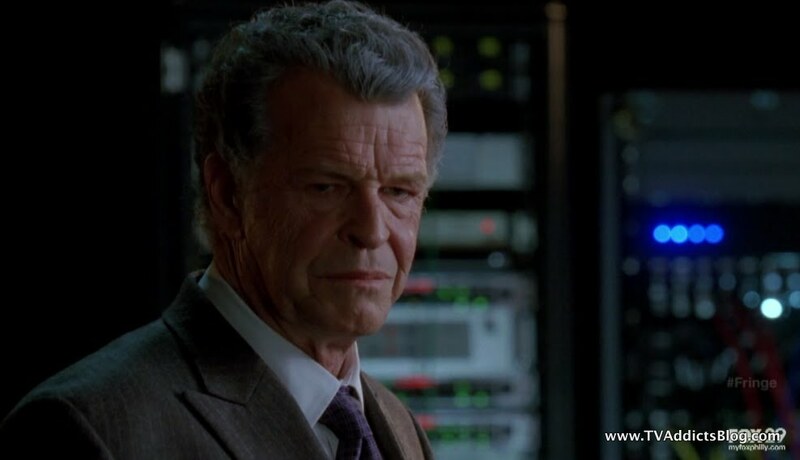 I agree with Mike's assessment of Fringe - in the beginning they could not decide if they wanted to be a serial or a procedure so they were kinda both. The serial parts sneak up on you, at first you don't realize that stuff you are watching is linked to past eps. ANother show I watch is Supernatural (in it's 6th season) that is like that. Started off as monster of the week and developed into one hell of a serialized story. Great show though. If it's Sci Fi serials that you like then I'd recommend Babylon 5 which is old but good. Battlestar Galacica's reboot was great. For non-scifi serials Sons of Anarchy is great, as is Justified which just finished season 2.
turned the machine on now. it's probably true that Olivia and Fauxlivia have never seen eachother. or will the picture be gone ?!? 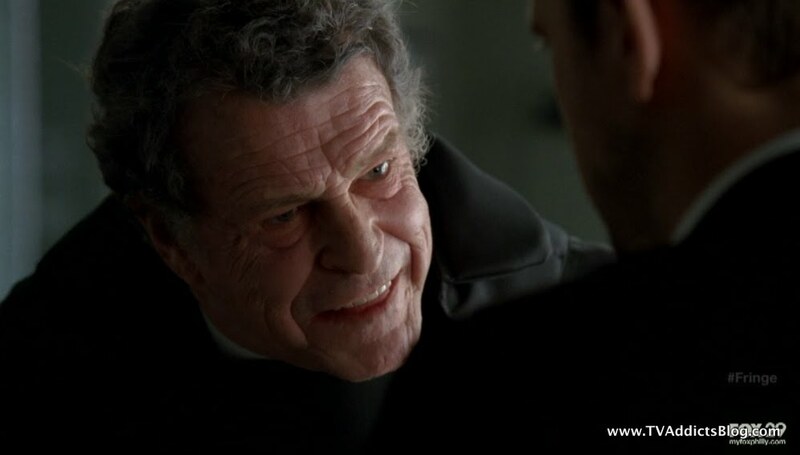 I'll add one more note to the Joshua info lol - The producers of Fringe were trying to "TRICK" FOX into thinking the show was a procedural show until they got to the stories they wanted to tell. And at that point, everyone was too committed to turn back then! Don't forget Breaking Bad in your list of Non-Sci-Fi serials! I can't believe I watched all 3 seasons of that last summer to catch up and we're still waiting for season 4 lol (this July though!!) And of course....for more in the Fantasy Genre...The Walking Dead. There's only a 6 episode 1st season to catch up on for now...and then we'll be back to recapping here in the fall! yep...all good points on Fringe stuff. We just have no idea....and that's where I'm thinking there may be something that falls through the cracks and provides evidence that peter truly existed. The blueprint may be changed in the future to only have Olivia in the machine or something.....or maybe the machine doesn't even exist. It's gonna be crazy. But then how did these people all end up in this bridged area between worlds that was created by a machine that never existed!!? Yikes..lol I still think Future Walter's subtle comment that Olivia will be the failsafe is an important thing to remember going into season 4. We'll see! 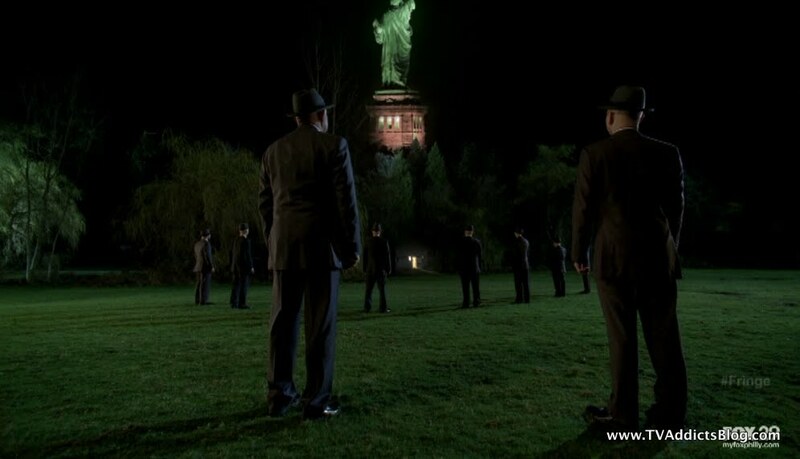 Did you notice a green color tint in the liberty island scene with the observers? I'm wondering if that could be a combination of red and blue. Maybe a third island--since the machine could destroy and create. A merged island, red or blue would have had him existing-normally. If so, that could mean that Peter never existed in this "new world" which acts as a bridge to red and blue. @Richard, I think my past 2 comments already covered that the Bridge is actually "the room" not the Statue of Liberty or the Island. Just that room that they were in. I took a guess that the room would have 2 doors....one leading to one world and another leading to the other. And this turned out to be factual. I don't think it's that spoilerish because the facts were right in those final moments of the finale! I don't think we need to overthink this. The big question coming out of that episode is HOW will Peter become relevant again? How will these people (or will these people) remember him eventually? The facts are there: There are 2 worlds. Over There (Red), Over Here (Blue). 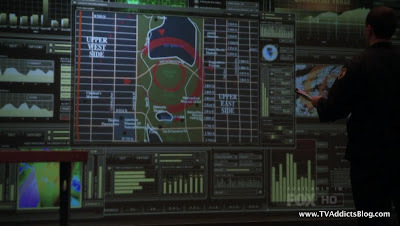 Peter originally destroyed the Red world when he got in the machine. Future Walter builds the machine, has it sent through the wormhole to prehistoric Earth(s?) with maybe Astrid and/or Ella going with it....he made a couple adjustments....one would send Peter's mind into the future to see the destruction he causes if he destroys a world. The other..possibly being a failsafe in Olivia. Peter's mind returns to the present....he understands how the machine works and manages to make THAT ROOM that they are in a BRIDGE between worlds. Important people (aka FRINGE TEAMS) will be able to move in and out of this room into each world (red and blue) in order to solve cases and fight to save both universes. ugh...off to recap THE EVENT now. I'd much rather keep talking Fringe! Dang - how could I forget Breaking Bad or Walking Dead ! Both excellent shows. I;m so behind. Haven't watched Event or HIMYM yet. But did see Chuck. Was shocked at the end, but will say no more until I know you watched. @MJ - it's cool...out of sight out of mind with BB and TWD! But yes, excellent shows! I wish there was enough time in the world to watch all of this stuff. I'd love to watch Supernatural, Justified, Nikita etc... hell, i'd like to go back and watch 7 seasons of Buffy...but I just don't know when I'd get to it! As far as Chuck, Event and HIMYM...i watched them all. Next Monday though, I'm going to miss it all. (will be traveling)...so No Event recap next week, just a discussion post. :-( I'll make up for it in the finale. They're not going to kill off one of their leads like that. But still...if the show goes for that cliffhanger, you have to provide the illusion in your scenes from next week! The episode was fantastic though. Morgan being the villian, the loads of Star Wars references, the Jeff and Lester montage videos of Chuck and Sarah, Chuck using the intersect to rescue Morgan from a decorating disaster. All good Chuck fun. And of course, Casey looking out for Morgan was a nice touch too. We have to think that the Volkov daughter is going to come around in the end, right? Of course, she has gone and done the unthinkable to Sarah...so maybe not! Ugh ! I just read that Chuck's ratings were horrible for Monday. Not a good sign for the penultimate ep. I did not look away fast enough so I totally know what you mean about their promo spoiling the drama of what just occurred. And of course they were not going to kill that person but at least let us soak in the shock before you negate it ! Loved the decorating save - and Ellie's face ! Classic. And Ellie kissing Jeff for saving the montage ! I know they had to quickly come up with these back 6 or 7 eps after they had closed the season but Vivian is annoying me. I mean - there were 4 experienced spies and she just disappears from them ? I agree about her turning back from the dark side (more star wars love) in the end - Ray Wise went out of his way to tell us that she just can't seem to bring herself to be bad several times. Love to know how they got Sarah's dna, and how come the room full of guys died immediately and Sarah didn't ? But that's tv for ya. Mike, I feel like you and I are on different planets in that you normally like figuring things out. There are several things where you admit you don't know, me too. Anyway, just to take my theory a step or two further. I think the island/room/whatever is a place he created with the machine, but without him being in it. He removed himself from what he/machine created. That way, the paradox is broken. This is being put on a new timeline. He could be in any point in time, but must also occupy a space in some form or other. EXACTLY! on the spoilerish preview! Agreed on Vivian. I think she'll come back from the dark side. And yeah...why wouldn't sarah die??? Unless there is a severity setting on that contraption. Maybe she was just threatening Chuck or something. I dunno! @Richard - I think we may just be on 2 different planets with this topic lol I do like figuring things out....making guesses...whatever you want to call it. 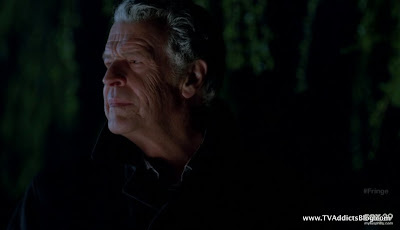 And there are definitely things to try and figure out with this finale of Fringe. But some things were made very clear in the episode itself. And these CLEAR things were confirmed by the producers so once that is done...I don't see a point in re-hashing and theorizing "AROUND" their confirmations lol I still think (and the Fringe producers confirmed this too) that LOST left things a lot more open ended where some crazy wacky theories could be come up with about the entire show or sub-segments of a show. FRINGE holds the reigns in a little closer as they are not a "MYSTERY FIRST" show. They're all about answering stuff quickly and moving the plot along. Interesting idea with Peter....i'll admit I don't quite understand what you're saying. But, in short, do you think he intentionally meant to disappear? I like the concept that he must exist somewhere....the whole concept of matter not being able to be creatd or destroyed. (if that is what you meant lol) That sounds like something Walter might say when trying to bring Peter back into existence lol But I, personally, don't think Peter intended to disappear after bridging the 2 worlds. He seemed to be all knowing and understanding but I don't think he thought that far into it. Here's a question though...why would Peter just cease to exist? I understand why he might not be in that room at that time. By creating the bridge between worlds, they avoided doomsday...and the machine "built for peter" was built in that doomsday future. So Peter may have been off doing something else that day (in the red world or blue world) instead of being in the machine. But why would Peter not even have been born? I know we mentioned this above...he may have died as a child because Walter may have not intervened. But what in the past would have been changed from their FUTURE action? It doesn't really make sense! The only thing that would seem to be different is that the machine never would have gone back to the past. Future Astrid or Future Ella would have not taken the machine there. Would the ripple effect of that cause Peter to not even be born? Or cause Walter to not cross over and save Peter's life? Here's another wacky theory....oooh and I like this one. What if Walter ended up saving his ACTUAL son Peter and not the Red World's Peter......it would explain why Joshua Jackson is still on the show...and it would also explain the Observers saying that THIS Peter never existed. Hmmmmm!!!! Did I just figure it out!? lol I hope that's not really the case though...but it would absolutely fit the conclusion of that finale. In the show a few key "truths"--there are more than these of course. 4. Observers have said Walter must be willing to sacrifice Peter. 5. Tearing holes between the worlds moving things out of one into the other creates imbalance--matter can't be created or destroyed. 6.The machine may or may not be able to violate 5 above, not sure--this is scifi, but I doubt it will violate that law. 7. The machine is supposed to protect Peter. In the beginning of the finale Peter saw and learned from Walter about the paradoxical nature of what is going on. So, since he is the cause(in many ways) of the original imbalance--yes, he intentionally removed himself from the bridge he created. That way the paradox loop can't continue. He in some ways sacrificed himself. 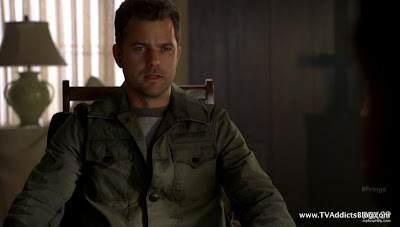 IMHO, of course one of the biggest mysteries going into season 4 will be what happened to Peter--I hope we don't find out in the first ep--LOL. What we know is that he is not in this bridge, he did exist, he does return and normally matter can't be created nor destroyed. So,his spirit and/or body in some form must occupy a place in time and space. Where and when and in what form(probably no real change given this show) are a mystery. My first guess was blue land since that's where the machine is that he originally got into, but I'm not sure and after thinking about it, who knows? In reference to one of your questions, imho, it is likely that in this bridge world, Peter was never born, since he never existed. Other implications of that are going to be other mysteries as well. (btw, at the end I was wondering if Olivia/Fauxlivia were looking at each other in that way as perhaps they have not yet seen each other?). One key question for me is what will make them recall what they're doing there, their purpose? Will others be able to get in and out of the bridge world, lots of questions? We also know or at least assume that the red and blue worlds are still experiencing the vortices/tearing. Since these 4 are supposed to find a different way to fix them. I suspect that Olivia's ability to mentally project work in other worlds will become key. What's really in the back of my mind is what is the overarching story that covers 8 seasons? And how does this fit into that? That to me, is the big mystery. I think we are just beginning to see that mystery open up with our questions. Richard Agree with your 7 truths. I still disagree that Peter knew he'd disappear by his actions! Or else he wouldn't have said "WE can begin to fix......" before fading away. He was including himself in that mix. I agree, and have also stated that the biggest mystery is what happened to Peter and how will he come back into the fold. And yeah...based on what we've seen in seasons 2 and 3...these cliffhangers aren't resolved in 1 episode which I like. I'm also really interested to know, like you mentioned, if they know what they're doing in that room. i.e. do they know how they ended up there. And will it be a different reason than Peter creating this bridge? We just don't know. 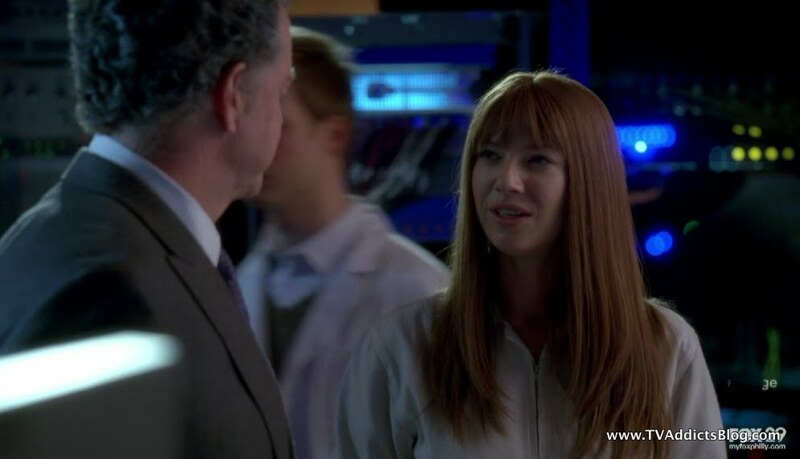 I still say that Olivia and Fauxlivia were looking at each other like that BEFORE Peter disappeared...this was during the same time when Walter still acknowledged Peter's existence. I don't think Time was officially rebooted until Peter disappeared. But we'll see. Totally agree...it's hard to tell where this would go if we get 8 seasons...but they have a plan for 8....so it's definitely a mystery to where they think this story will go. But it appears...as we suspected...that the 2 worlds will be key in it all. We never thought that one world would really be DESTROYED at the end of this season. Well, I didn't. They spent too much time creating this red world to just get rid of it so quickly! But where the show evolves from here? A total mystery...and I'm glad it is. I like to be surprised about what direction they plan to go! Your Peter theory, blue alive/red does not exist is interesting. And I'm glad you're thinking about possibilities. It's good to see with these exchanges some good ideas/theories that when season 4 starts can be compared to "reality". I'm not saying that Peter knew exactly when he was going to go within the minute or so. But, I do think he had to break the paradox and changing things as he did in order to do so resulted in him disappearing. Since he was in control of the machine and it makes for some good TV, I went one step further with the notion that he knew he would disappear by doing so. You're right about his "we" comments too. Agreed Richard. I'm not against theorizing what's going to happen! In some ways Peter's attempting to break the paradox may result in the machine not being built, particularly not for him. So Olivia may be the one the machine is built for,if it is built. Don't you think Future Walter was a product of his timeline and world? Meaning that since that Future Walter does not exist, some of his ideas won't exist. 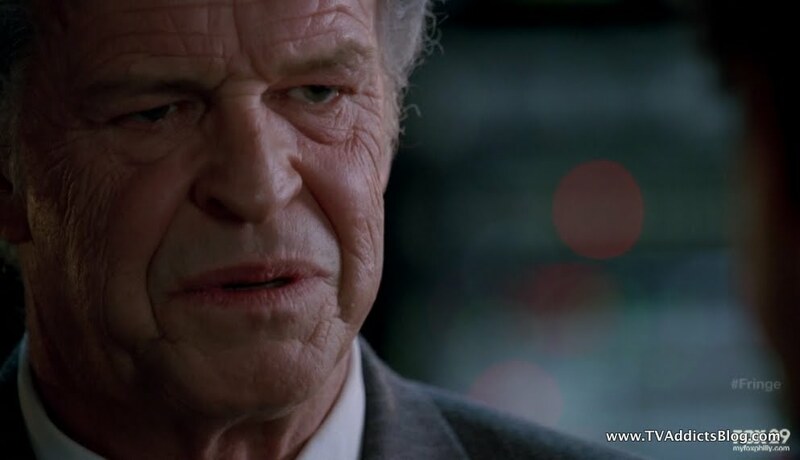 Right now, in the attempt to avoid that Future Walter from becoming a reality, Peter has arranged for Walter/Walternate to work together to avoid that world/timeframe. And as you pointed out, the machine hasn't been built yet. Wow, (insert light bulb idea--dimly-lol)wouldn't it be sad if this became a predestination paradox? Such as that Peter doing this in an attempt to break the paradox was what he does anyway. And the two Walters is one reason why there are two machines? Right, I have also mentioned that the machine may be built for Olivia instead in the "altered" timeline. I've thought of that too...but hadn't voiced it yet lol So essentially...that future will still play out because what we just saw happen ALWAYS happened anyway, right? In other words: following the LOST rules "whatever happened happened" however improbable...it STILL happened lol I don't think they'll go this route though. But it sure would be interesting to see HOW they'd explain any of this if they did! Doc Jensen interview with fringe producers. They answer fan questions. 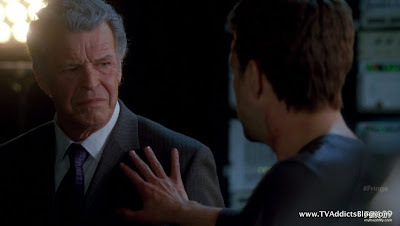 Just watched the pilot of Fringe and it was a great episode. I will definitely have to add this into my schedule. Thanks for the recommendation and i'm going to try to watch as many as I could to catch up before the new episodes return. I hate that I have been missing out on this for so long but thanks to you I know now. I'll probably skip to the last 4 episodes like you said and then i'll watch all of season 2 and 3. I just don't think I have the time to watch the full 1st season as well. Joshua - Way to go on starting Fringe! You're most definitely welcome on the recommendation. It is a fantastic show. And, while I agree that most season 1 is not essential viewing, it is still very entertaining and they tied a lot of stuff from season 3 back into season 1. I caught a lot more on my rewatch of season 1 after having watched seasons 2 and 3. So...maybe if you catch up to the current ep and still want more you can go back and watch the season 1 eps you missed. It's not a waste of time, I promise! Good Luck! 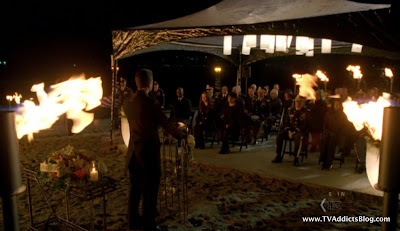 Hey, guys just wanted to let you know that I have written a new LOST Blog posting for the 1 year anniversary of the finale and it will be going live at midnight! Go check it out then! http://www.lostaddictsblog.com Enjoy and Happy Anniversary! I have always loved the fights between the two universe in which one is prime and other is parallel to it and the identical characters existing in the parallel world are even more amazing. 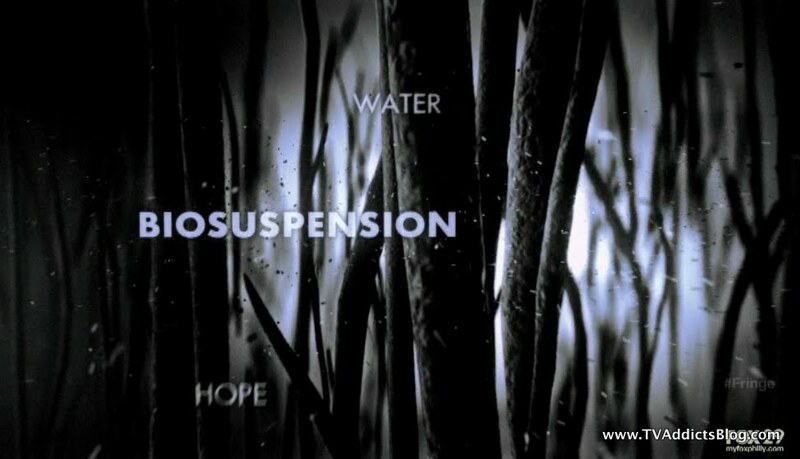 And soon the series will be back with new episodes of Fringe Season 4. 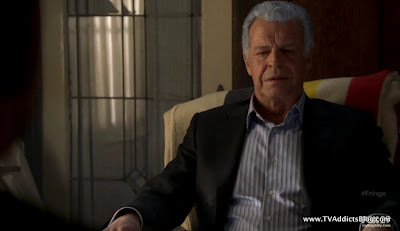 The Man with the X that was trapped in Olivia's mind (that is going to kill her one day)....the one specific thing he did was ask who Peter was. Peter introduced himself and then he said "nice to meet you". Here's my new theory! Somehow this Man with the X is going to surface in season 4 and remember that encounter. And it might be the trigger that something needs to be done to get Peter back! Like it? Hate it? Not even reading this post anymore!?! If anything exciting happens at Comic-Con maybe I'll post something on the blog so we'll have a new place to discuss. Okay, one more episode into the final 3 of season 3. I probably commented on this above, but I wonder if Peter's disorientation when touching the machine was a hint of things to come with his character. He was in the machine for a much more extended amount of time. The observers clearly say "peter doesn't exist"...but there always could be a caveat that he doesn't exist "in this scenario of this instance"....maybe Peter does physically exist but he just isn't involved in the events that led to them all in that room. Maybe he's just hanging out "OVER THERE" where he was never taken as a child by Walter. 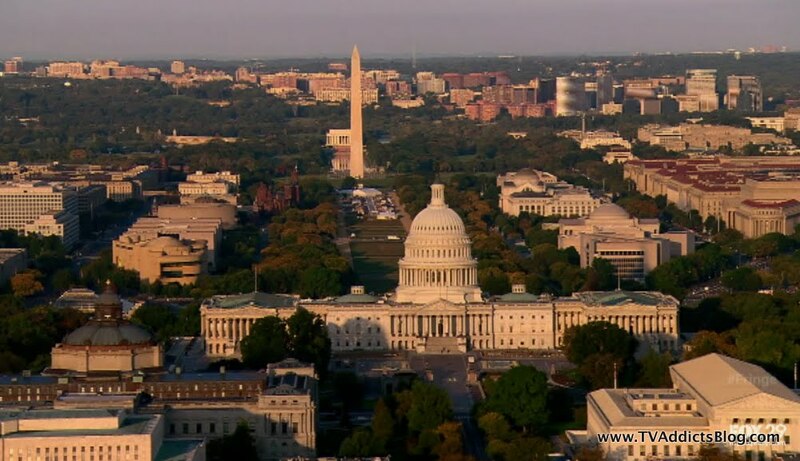 When peter touched the machine, he believed that he lived OVER THERE and that his father was the secretary of defense (which he is but he never would have gone to the statue of liberty OVER HERE looking for him). It's almost like he "HAD A LIFE" over there and for a few hours was in the mindset of that life. Each timeline brings slightly different decisions according to "September" the Observer. So maybe this "rebooted" timeline included a decision where the observer didn't distract Walternate and he saw that he had developed the cure for his son. And Walter and William Bell may have found another reason to cross over to the other side causing the destruction and chaos that followed. As for why they'd still all be in that room? Well clearly that is the result of the PETER in the only timeline we've known. But their reason for all being there? That's anyone's guess.